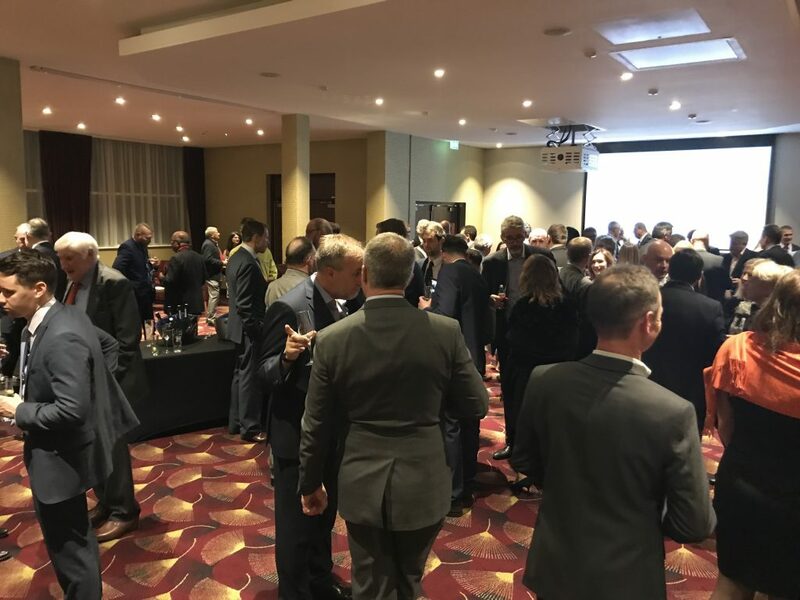 The best-laid plans of mice and men often go awry – no matter how carefully a project is planned, something may still go wrong with it. 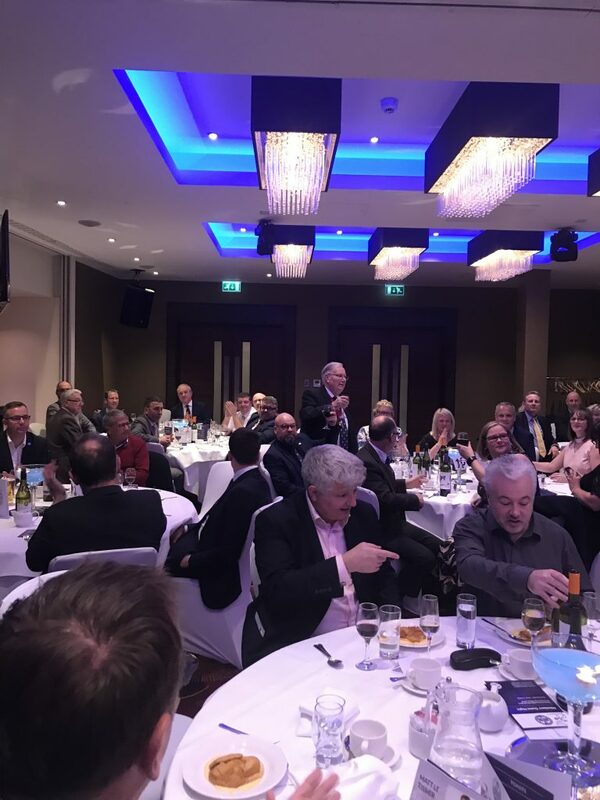 The saying is adapted from a line in “To a Mouse,” by Robert Burns and it was as true as ever in the case of the Old Friends Spring Dinner. 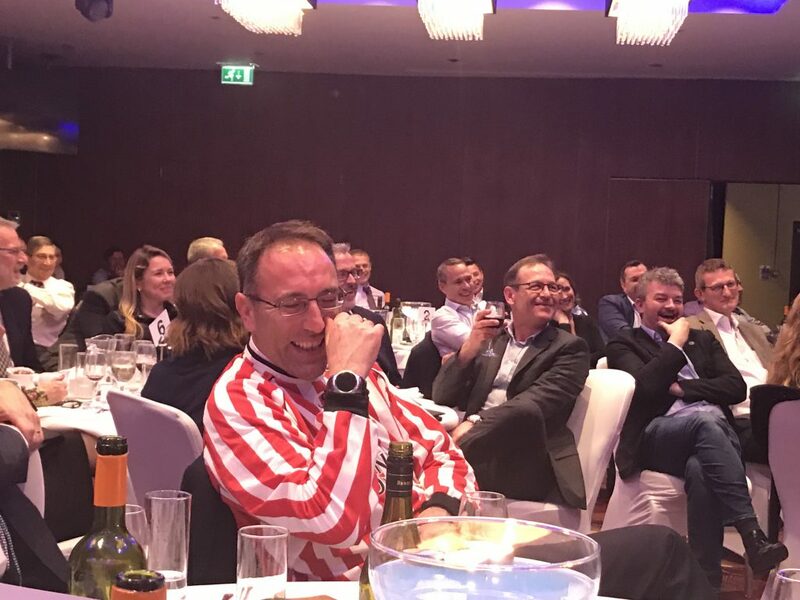 Determined to ensure a good attendance and a top-drawer speaker, the details for the dinner, with Guest of Honour Nigel Owens, were circulated straight after Christmas and with some encouragement over the phone, over 100 bookings were made, a very respectable response in the current climate. 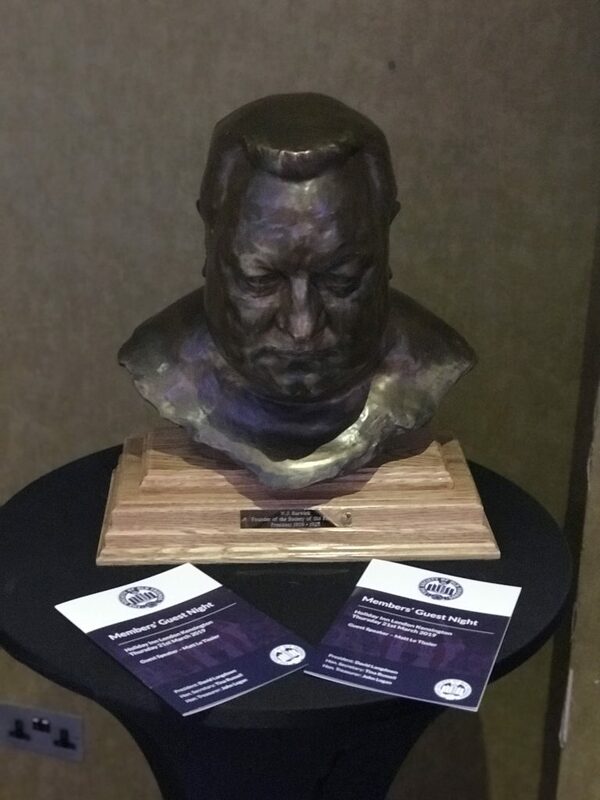 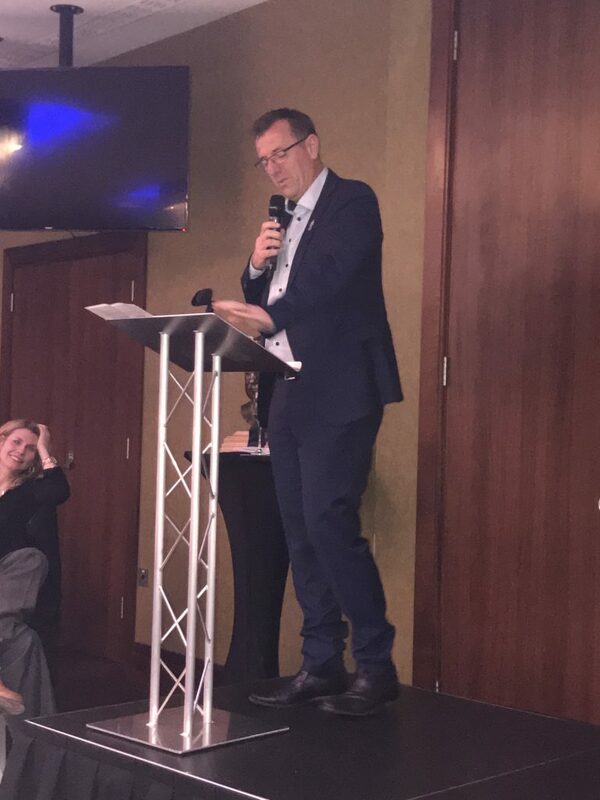 With marketing despatched, bookings made, speeches written, and programmes printed, it was therefore a shock and disappointment when Nigel withdrew two weeks before the event! 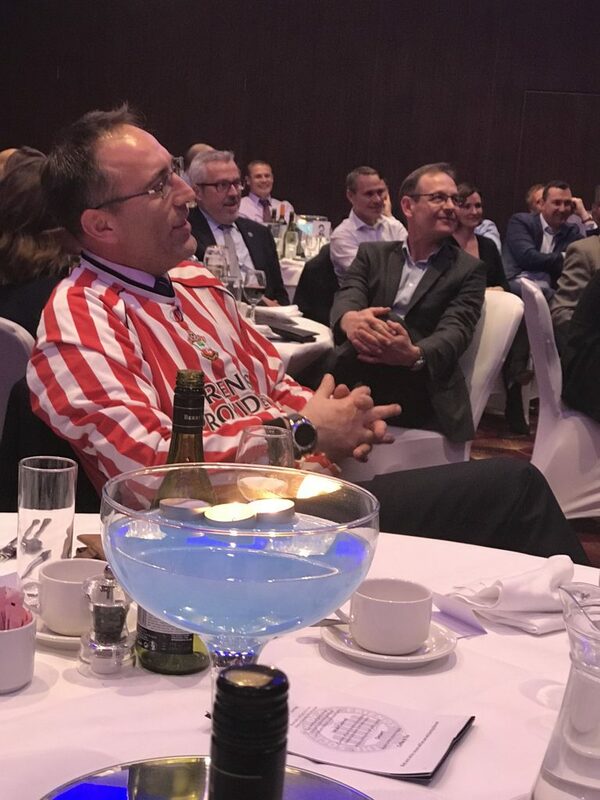 Cue much wailing and gnashing of teeth before former Southampton and England star, Matt Le Tissier was lined up as a replacement, and what an inspired choice he was. 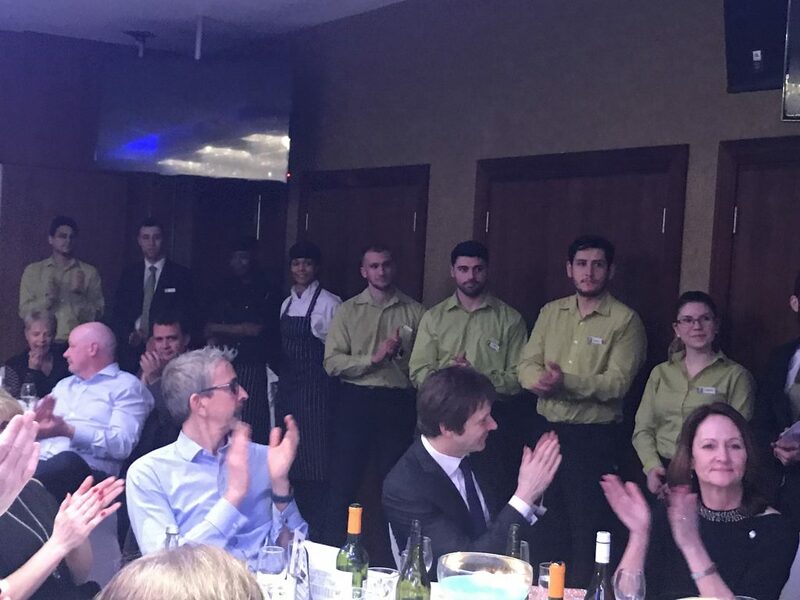 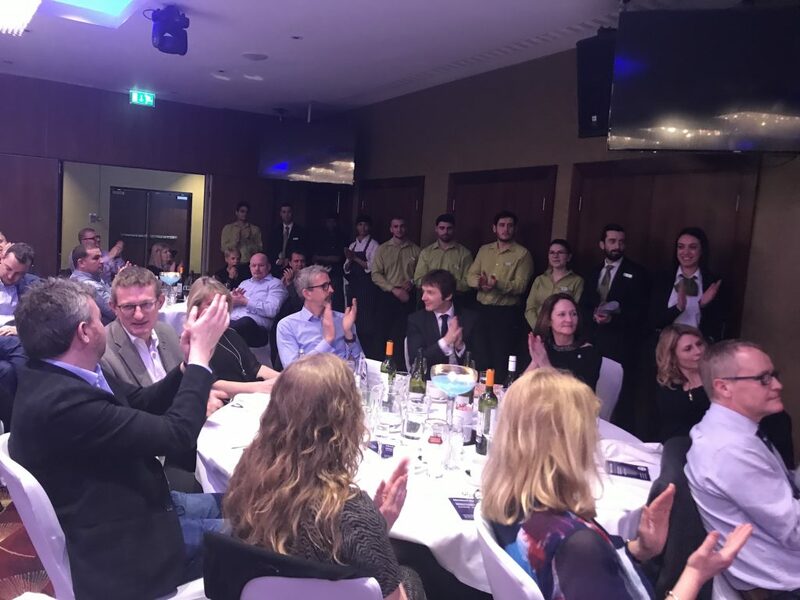 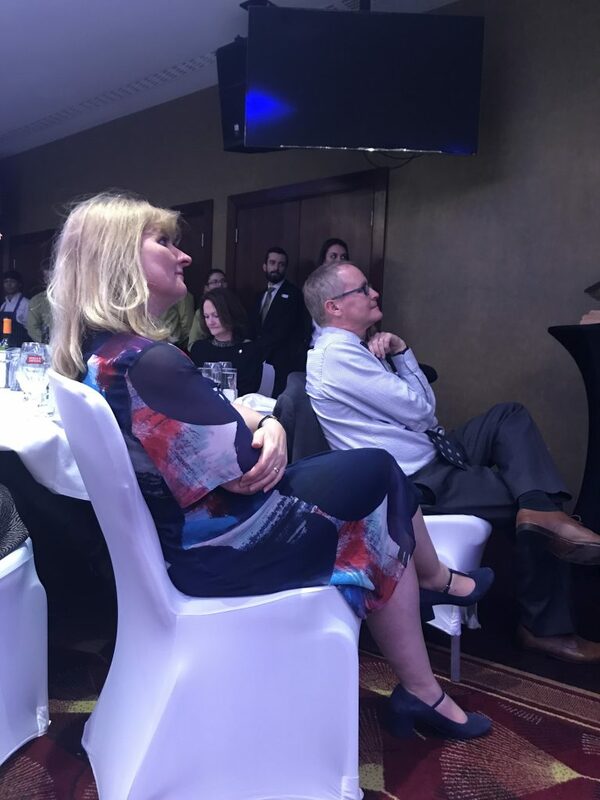 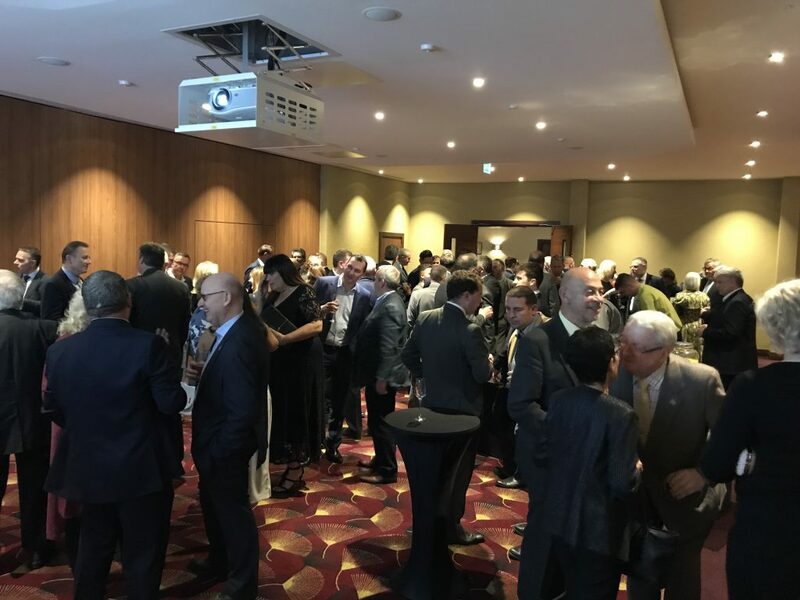 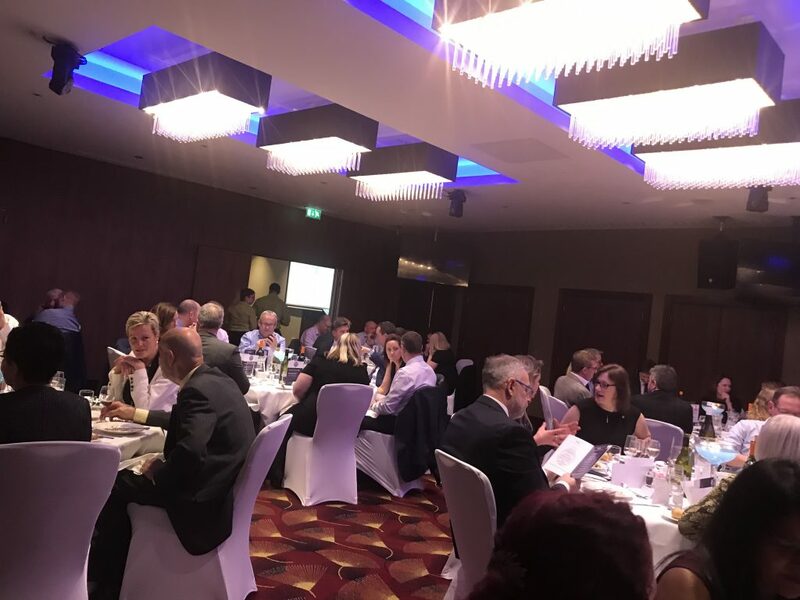 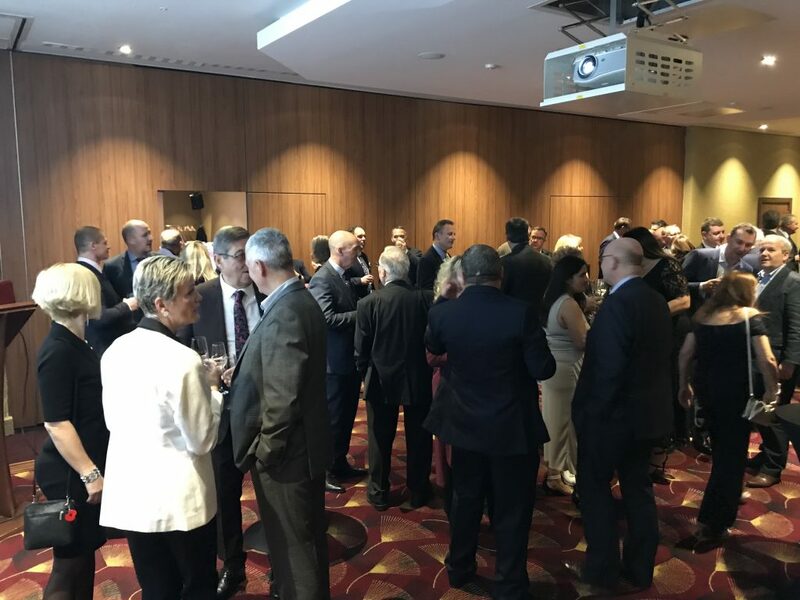 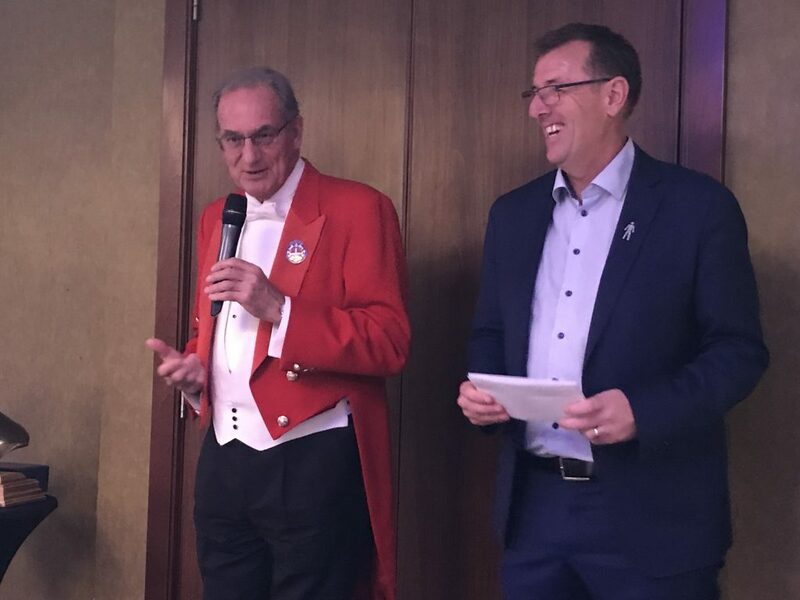 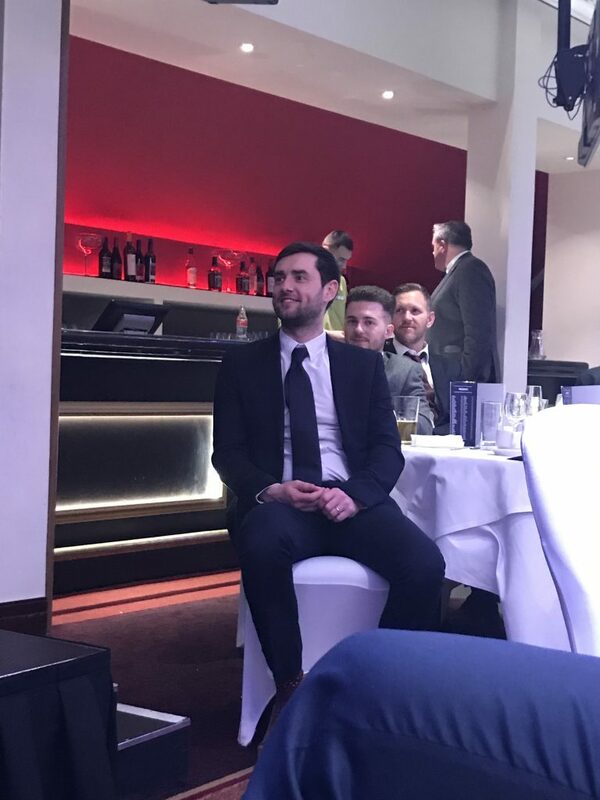 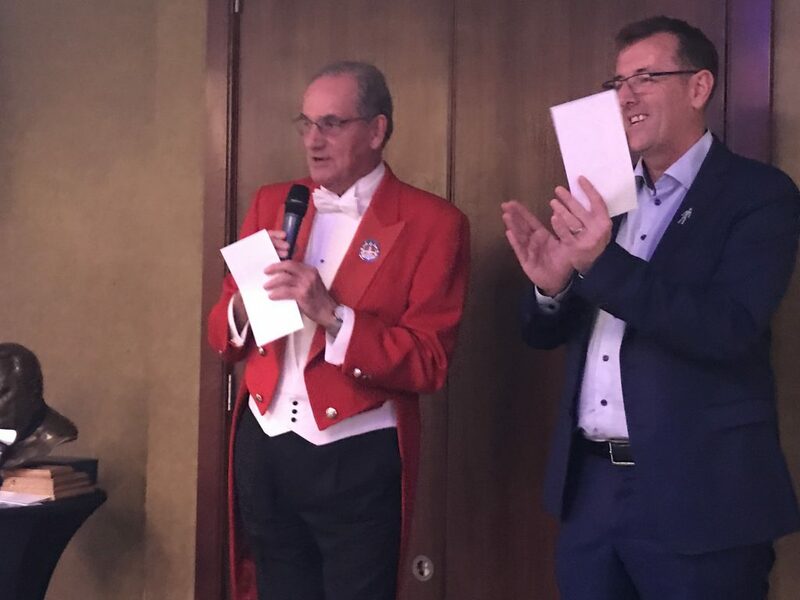 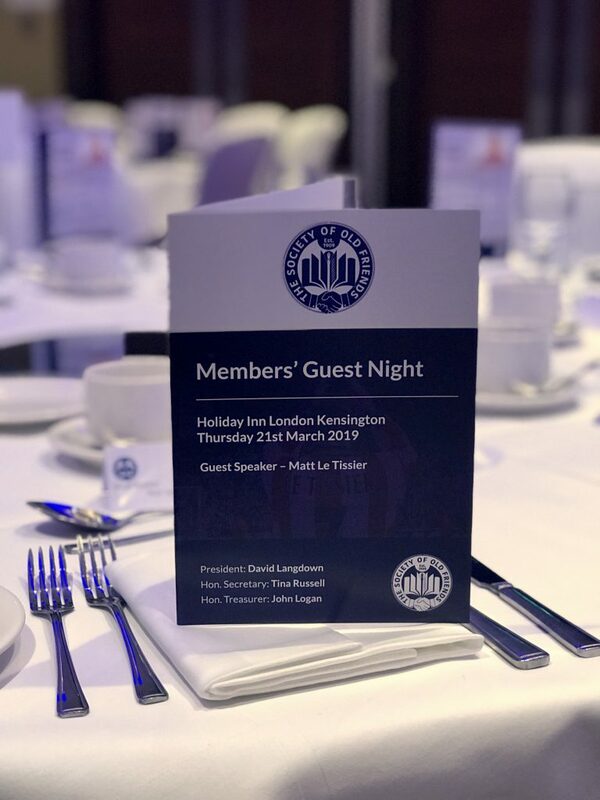 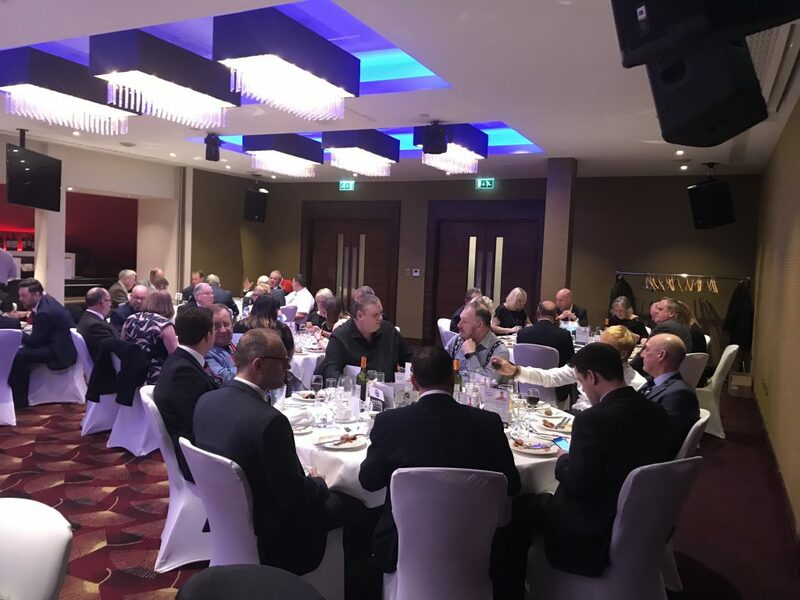 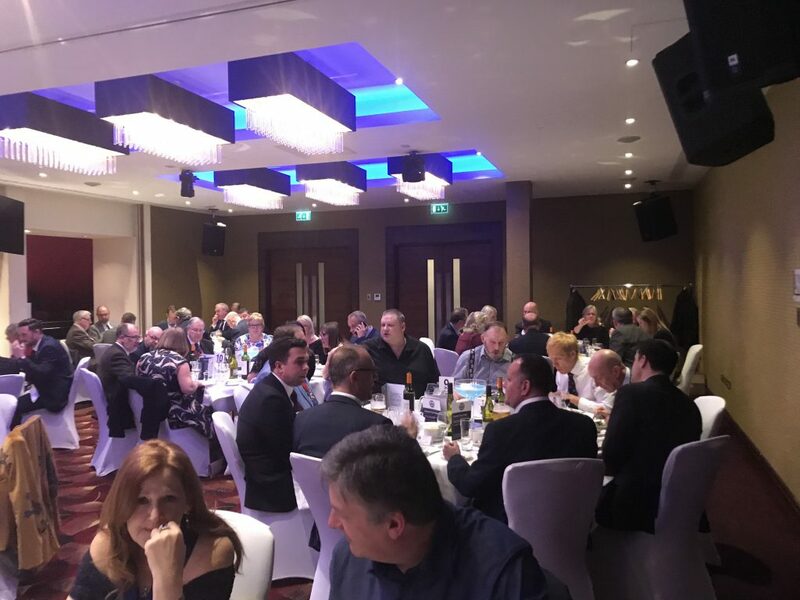 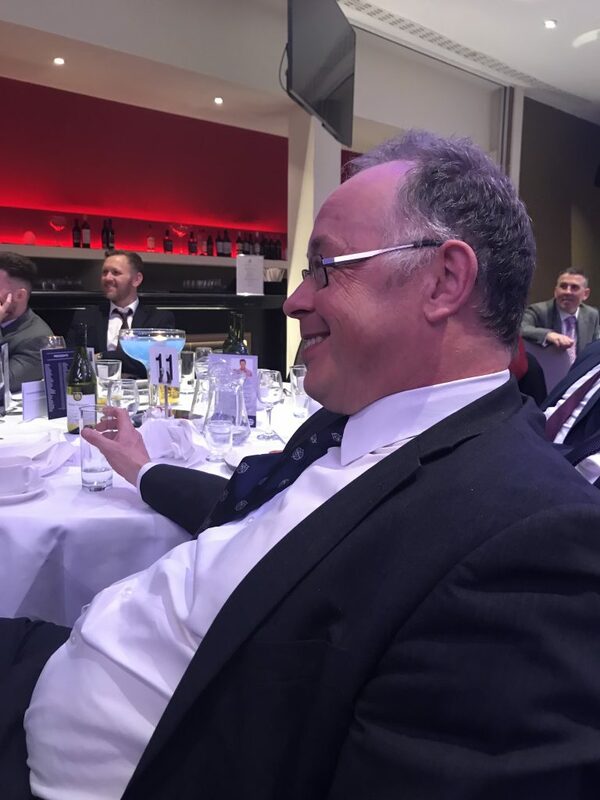 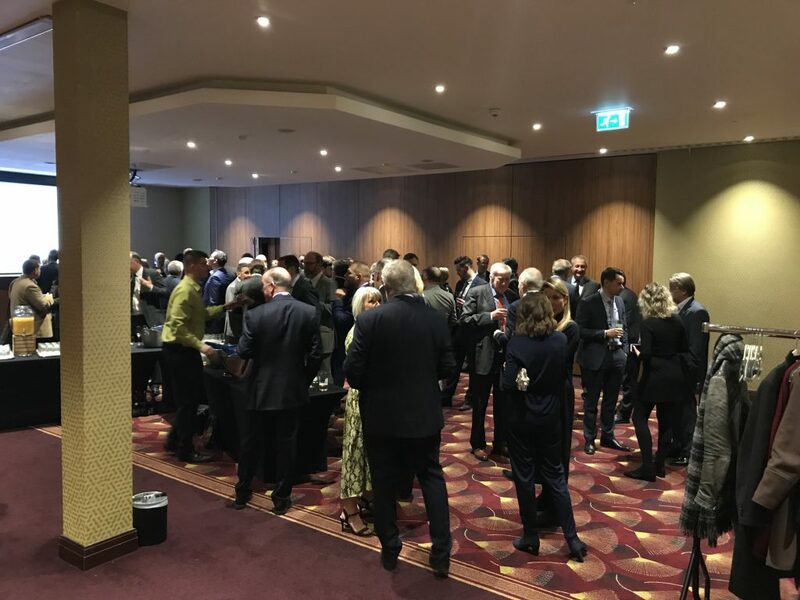 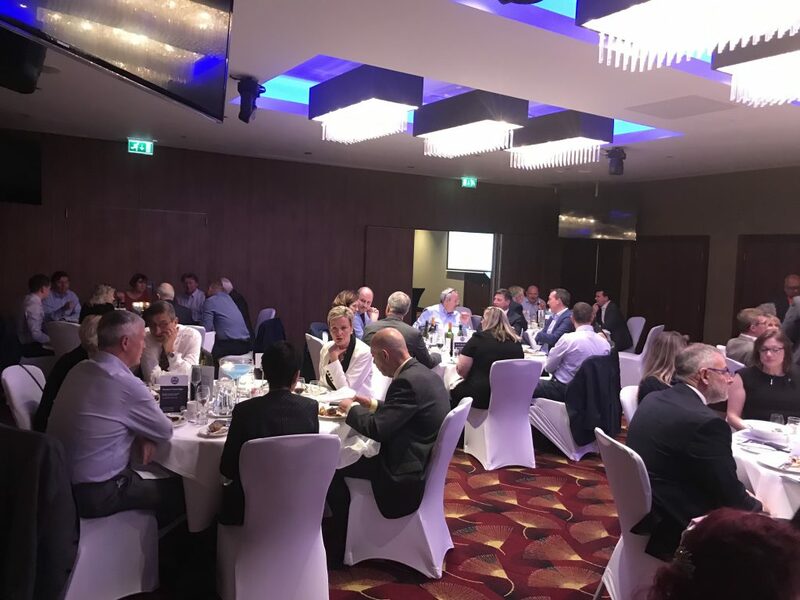 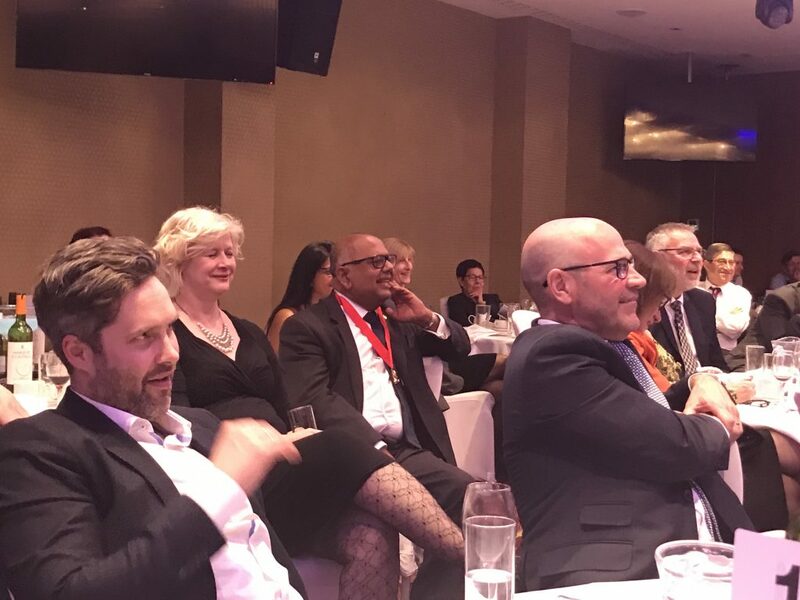 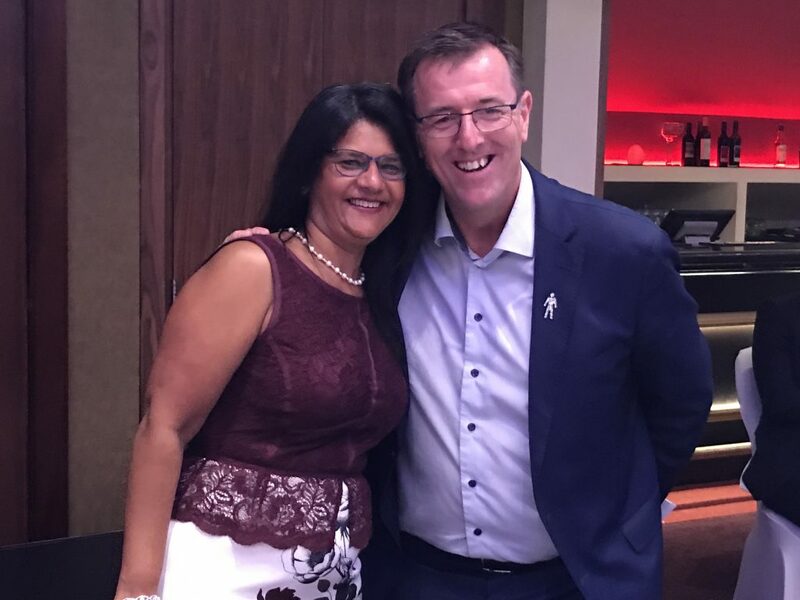 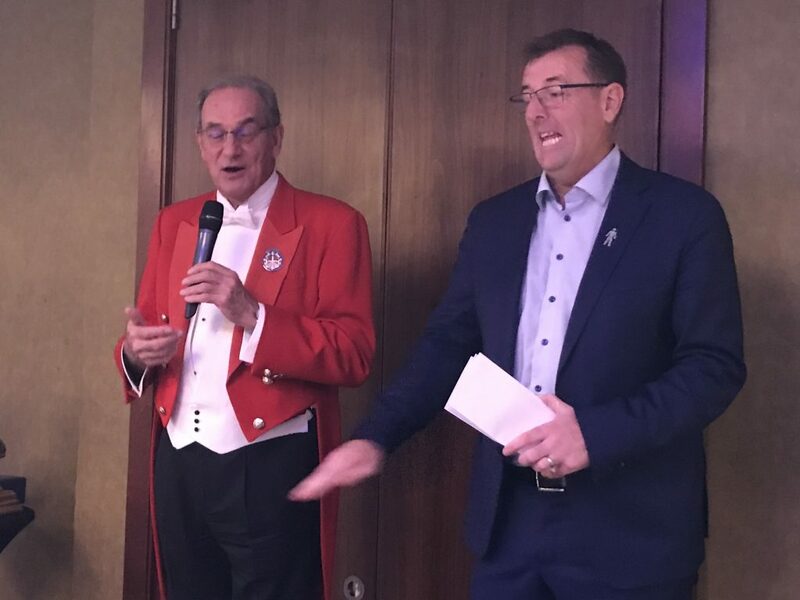 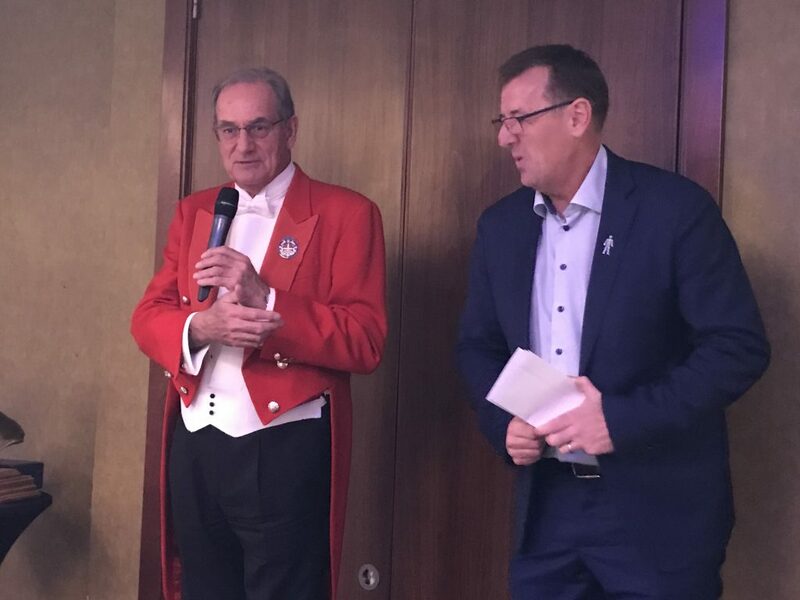 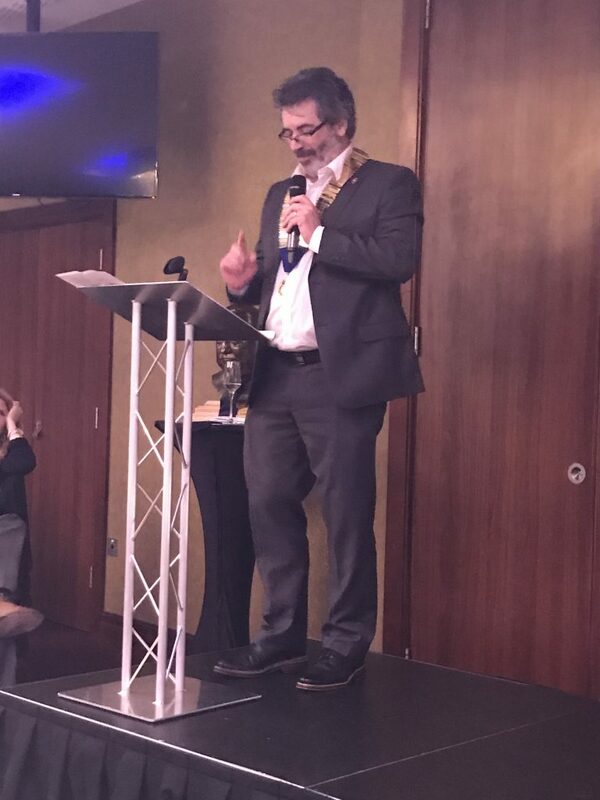 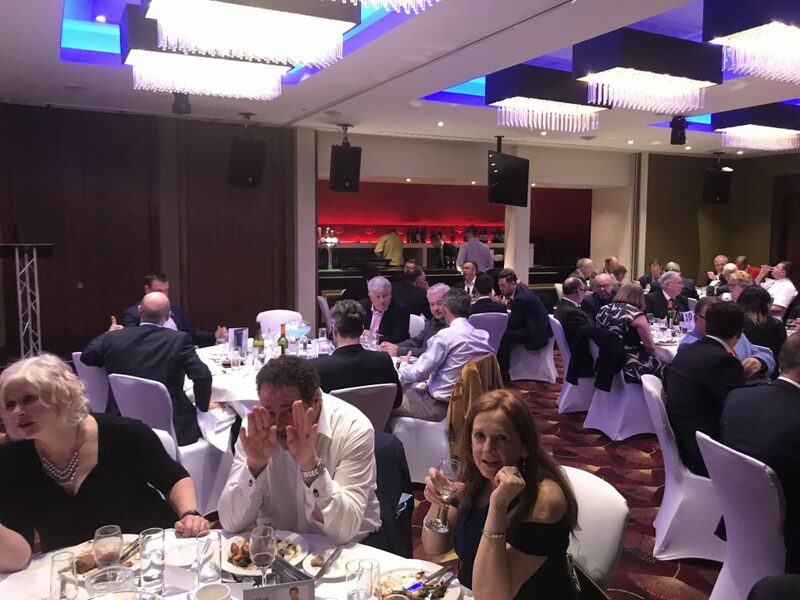 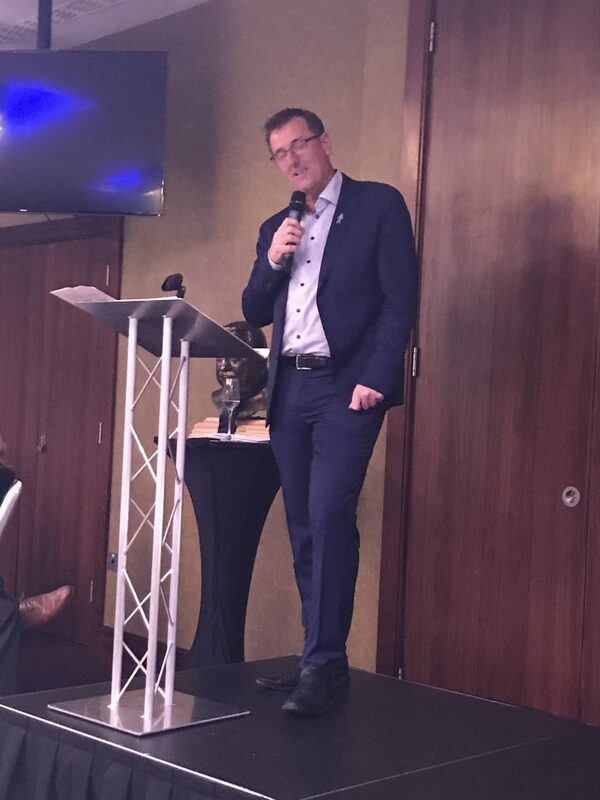 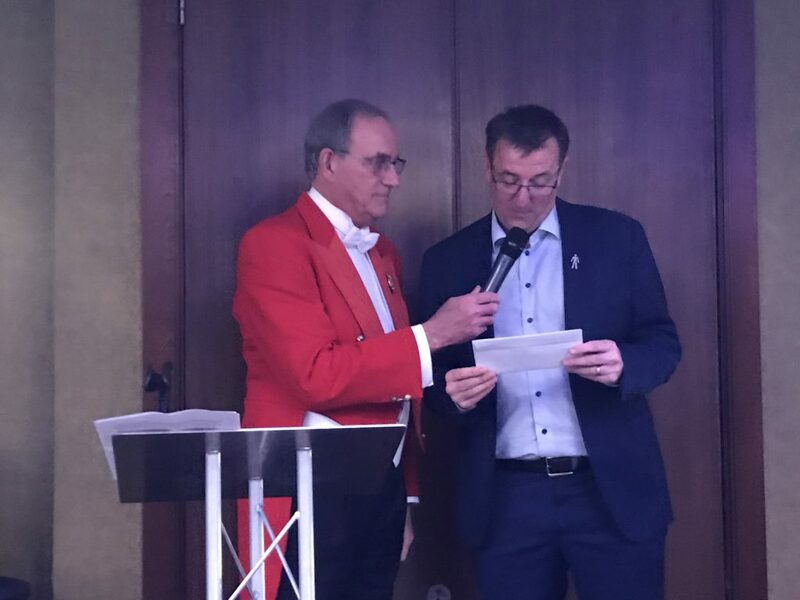 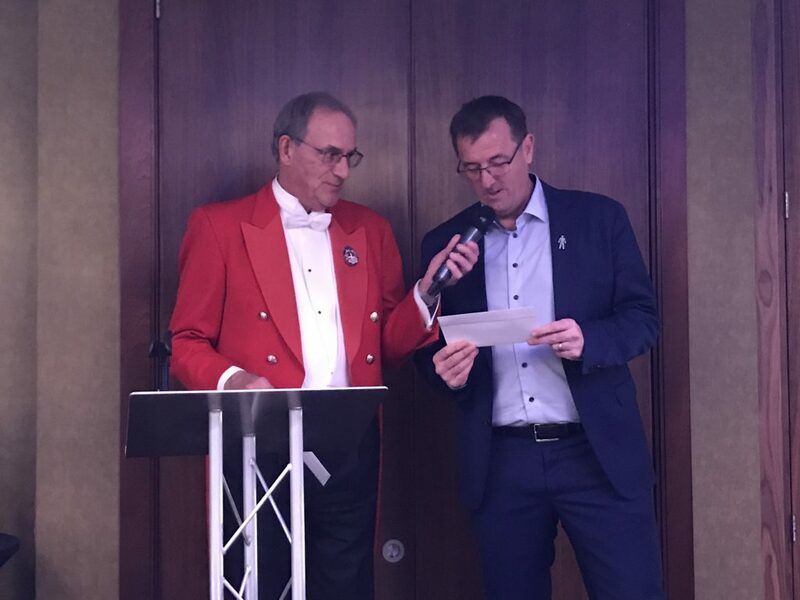 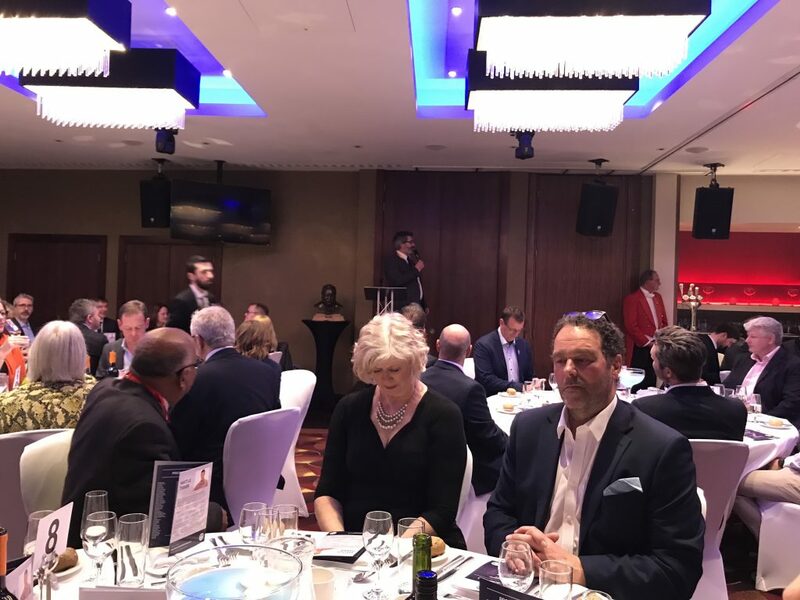 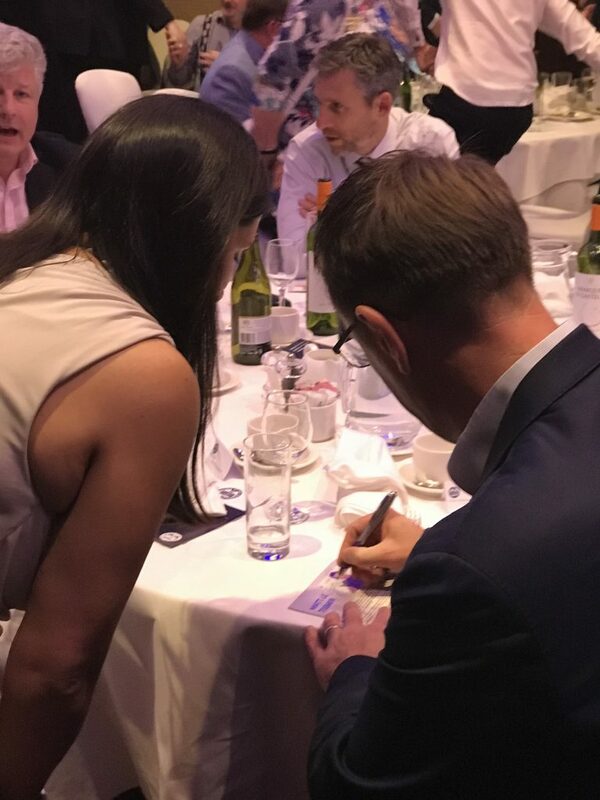 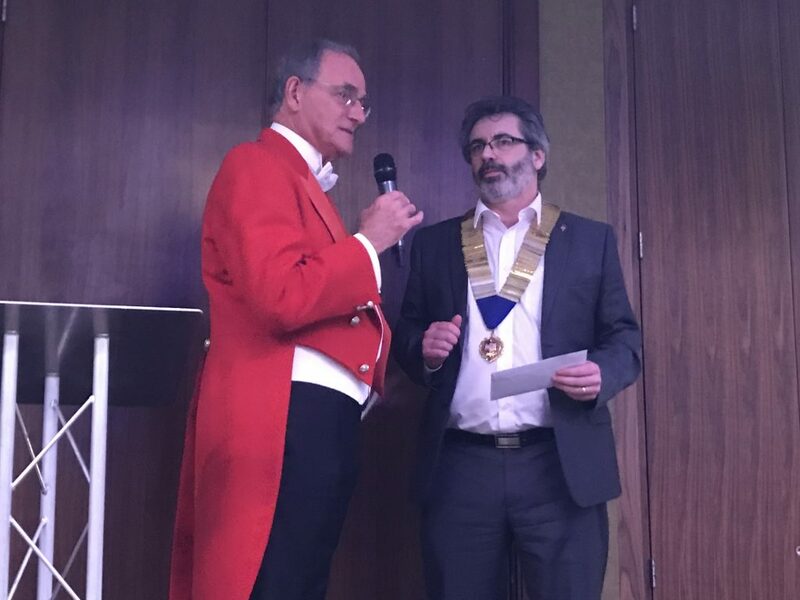 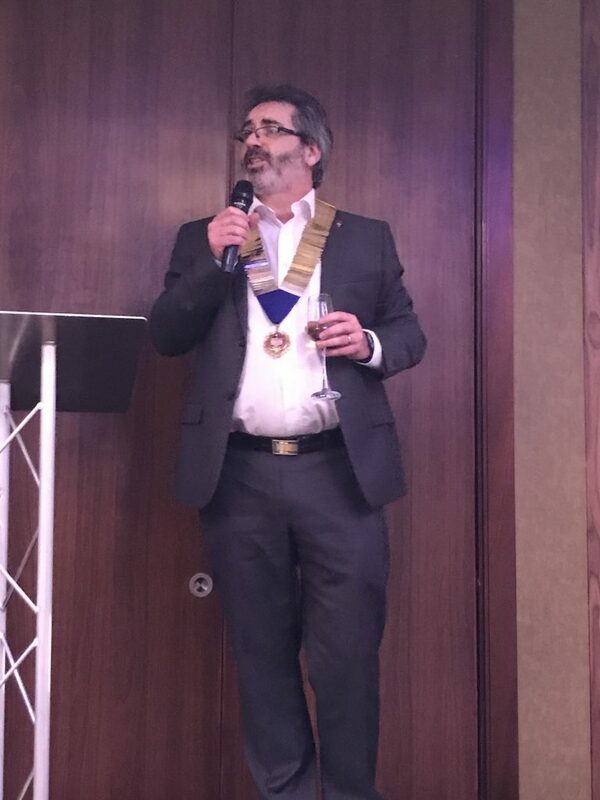 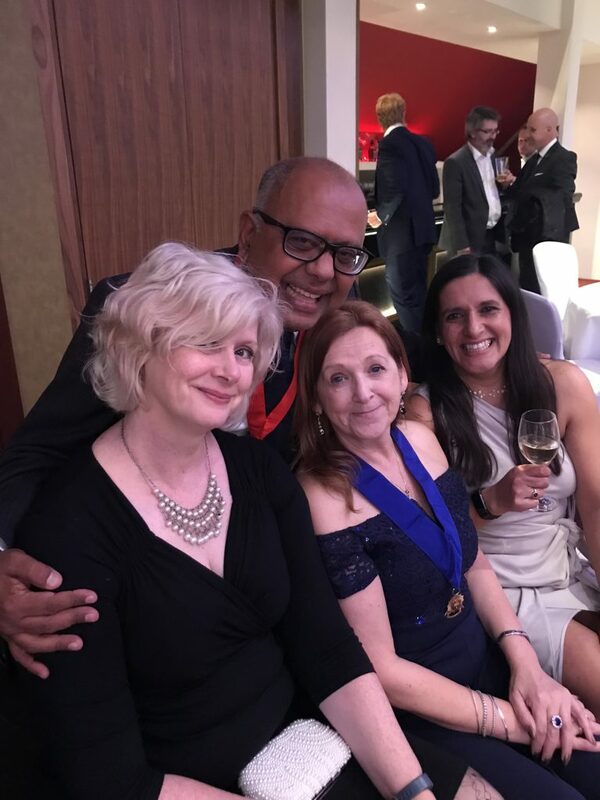 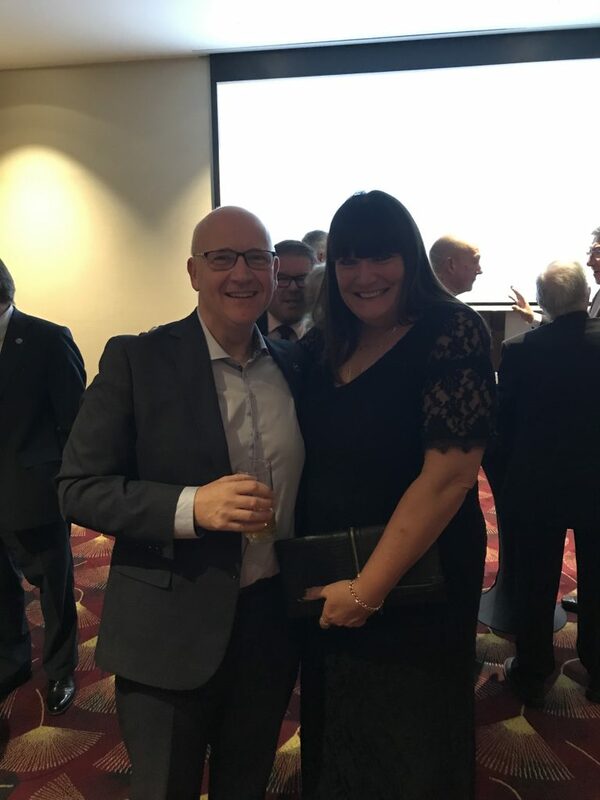 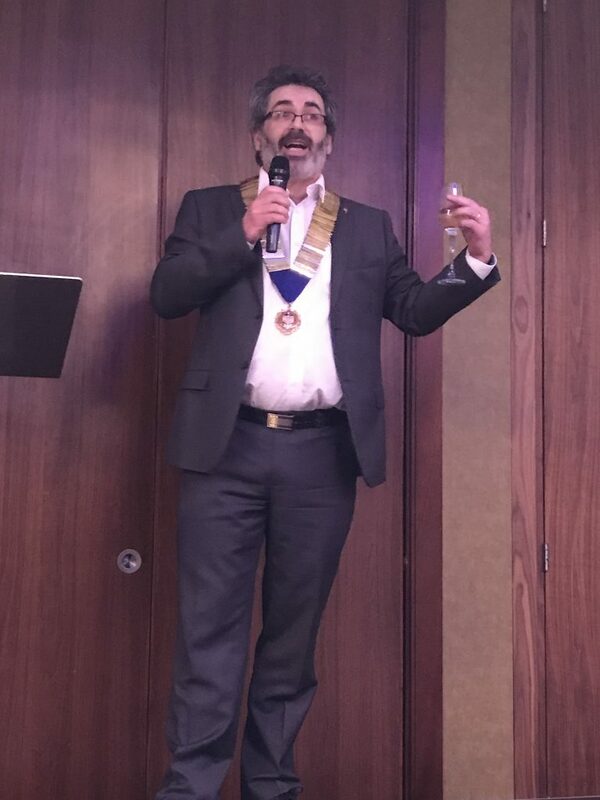 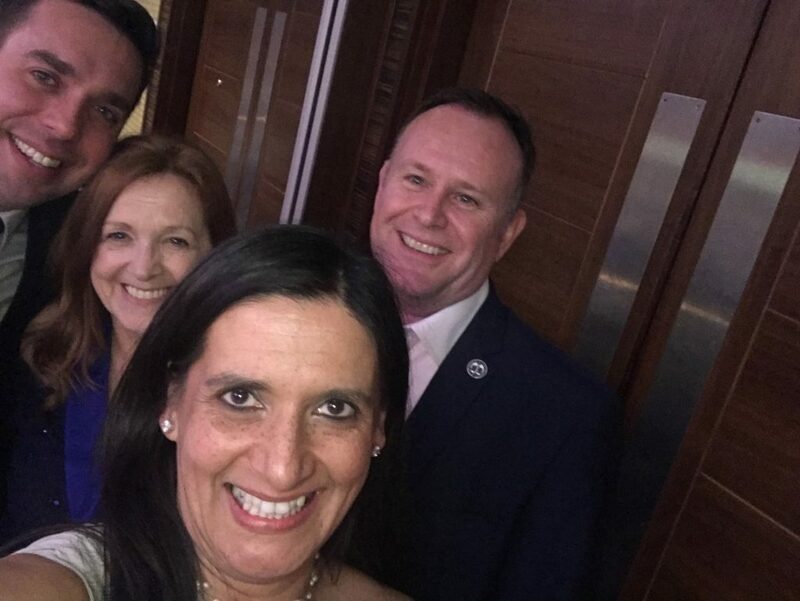 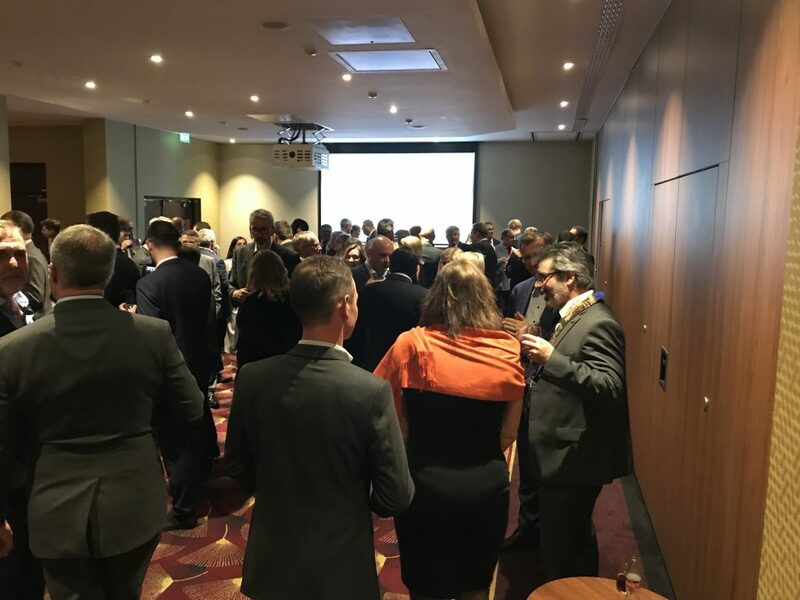 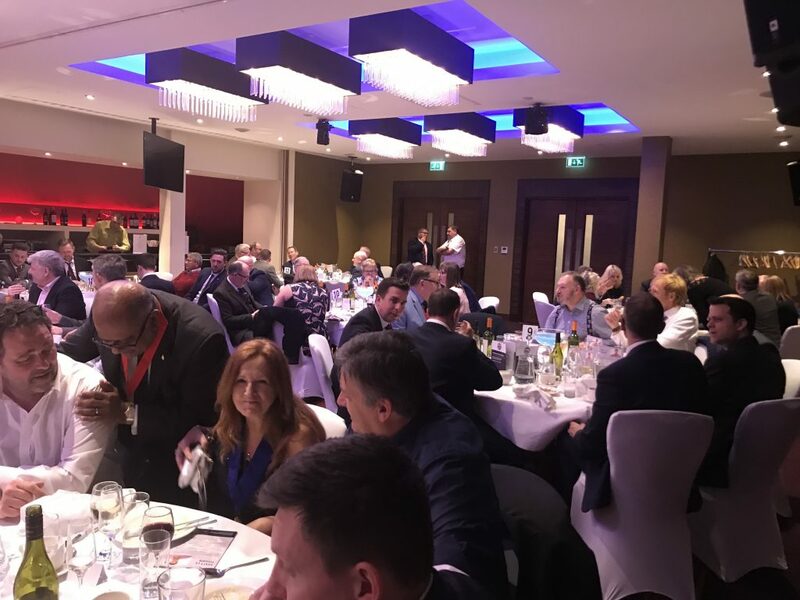 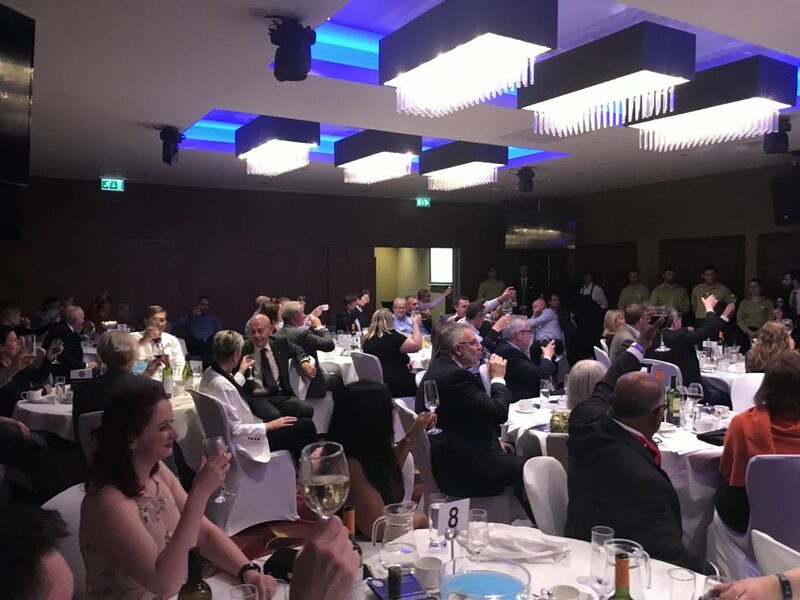 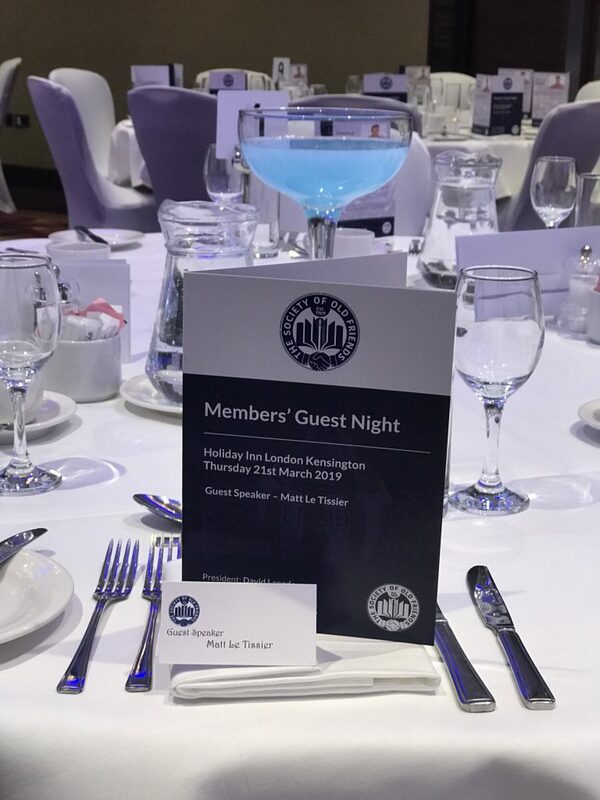 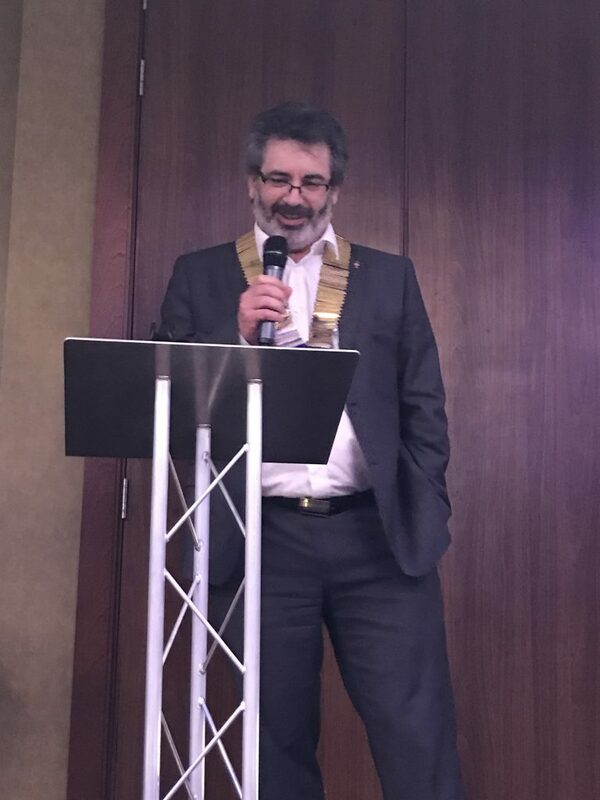 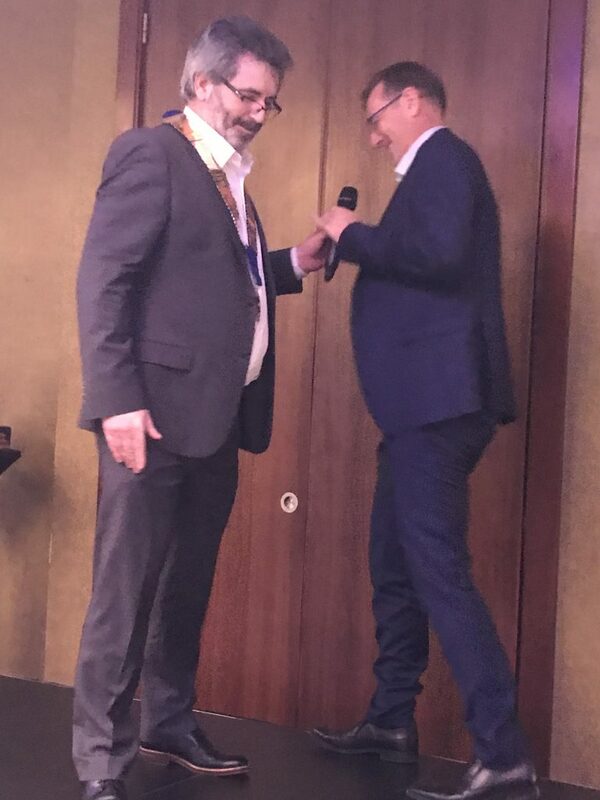 After a few cancellations from rugby aficionados and new bookings from football fanatics, 109 members and guests attended the dinner at the Holiday Inn, Kensington. 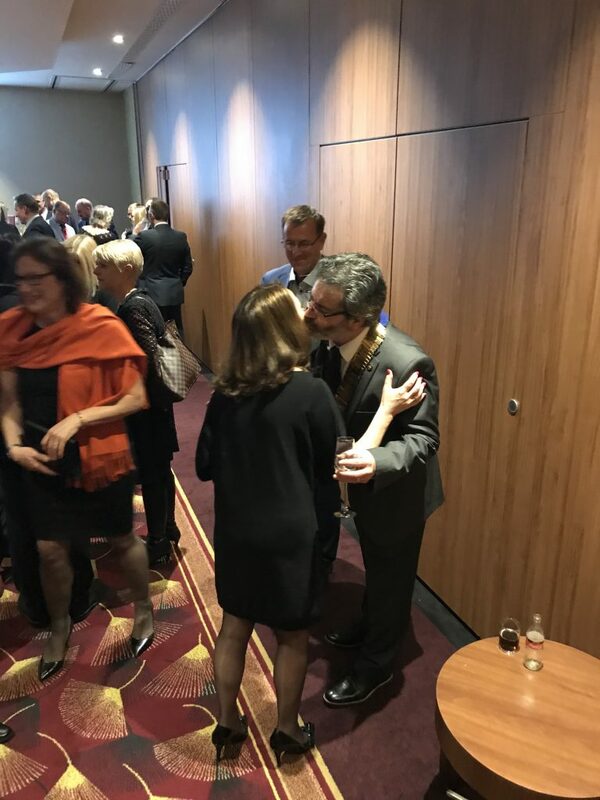 This was the first time the venue has been used by the Old Friends, and it won’t be the last. 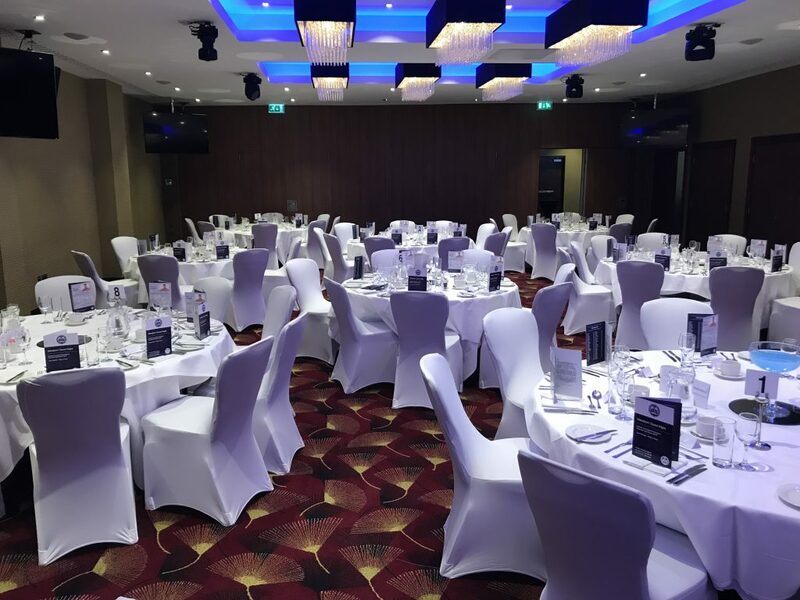 Easily accessible by tube, the facilities were excellent, the staff friendly and efficient and the Balmoral Suite provided great spaces for both the champagne reception and the dinner. 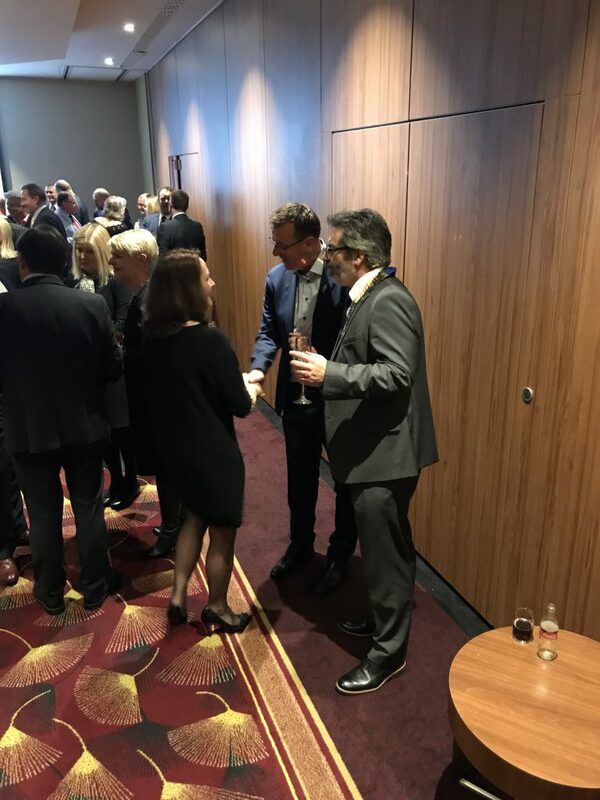 Our honoured guest was happy to greet each attendee in the reception and to pose for photos, sign autographs and enjoy some good-spirited banter. 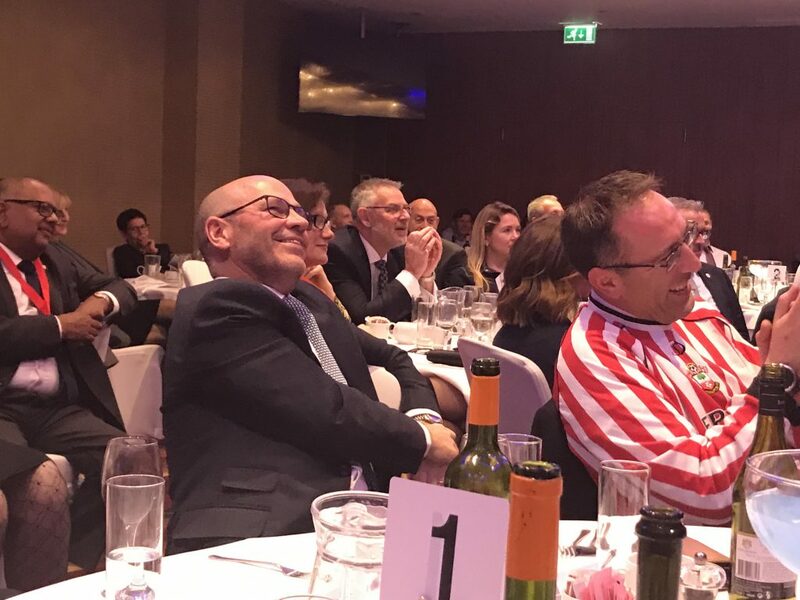 It seems that amongst Old Friends, there is a high proportion of Manchester United supporters. 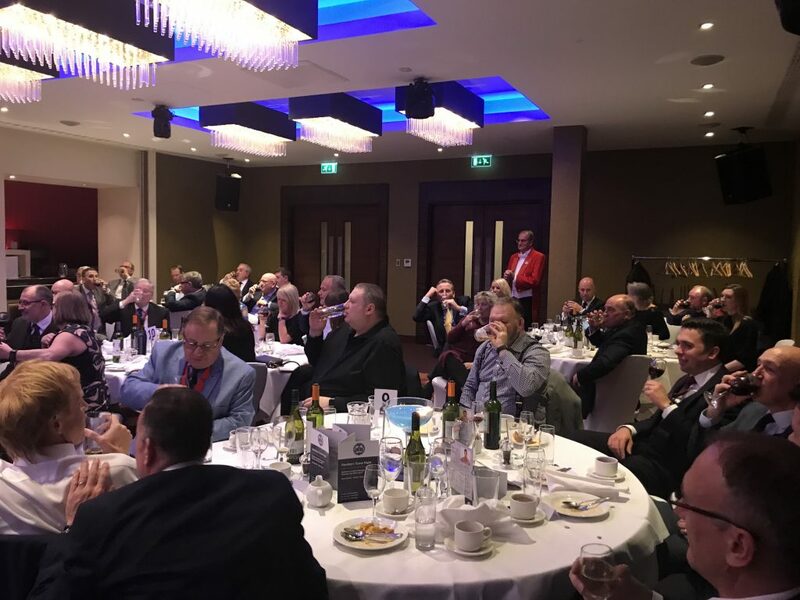 The President suggested this is due to their generosity and love of a good time, but his Honoured Guest opined that it was more likely that the Old Friends are largely based around London, the home of much of the Red Devils’ support! 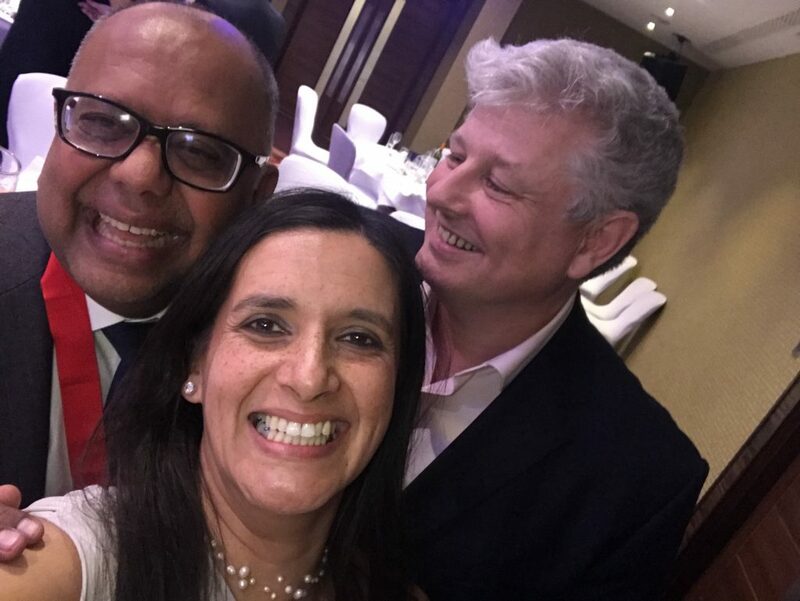 It was clearly going to be a feisty night! 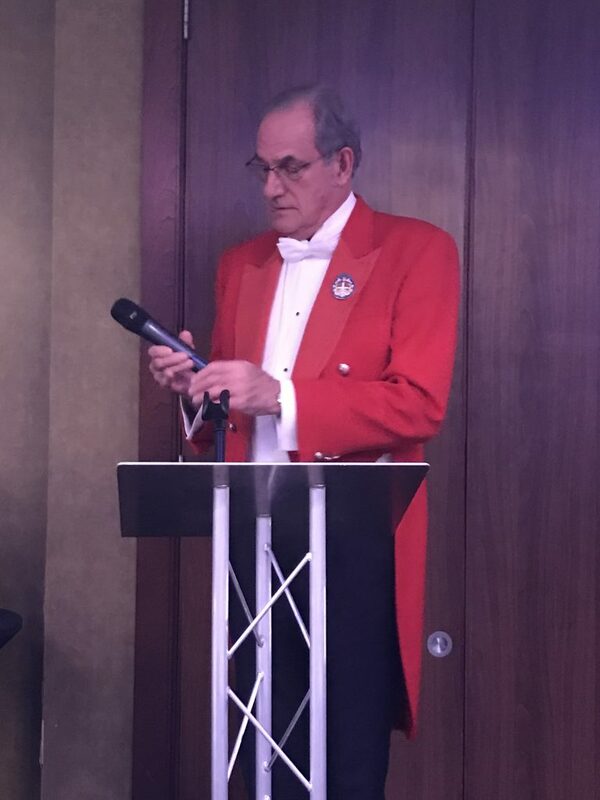 The President, David Langdown, welcomed the Old Friends and their friends before saying a Grace specially written for the event. 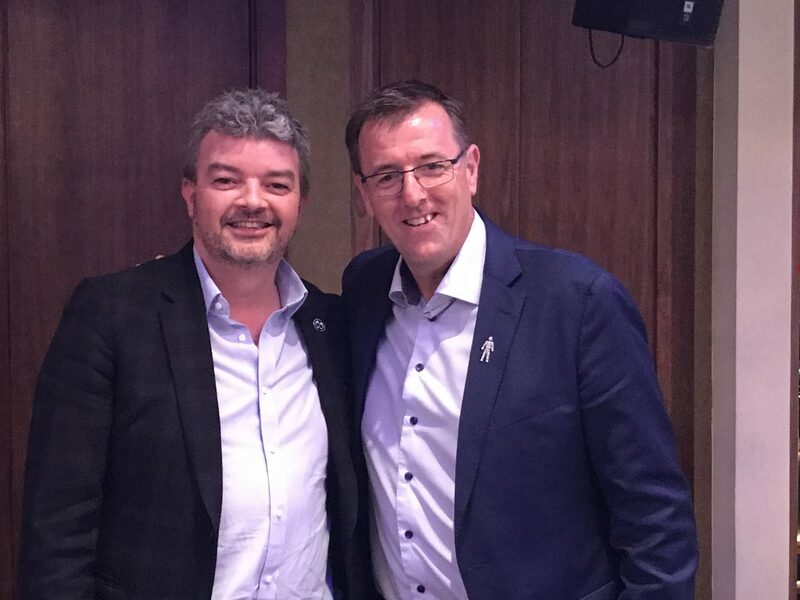 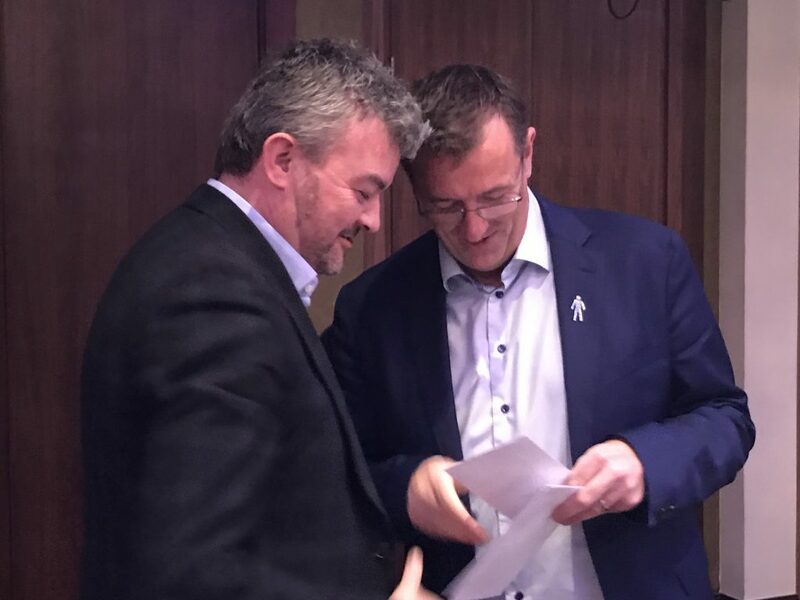 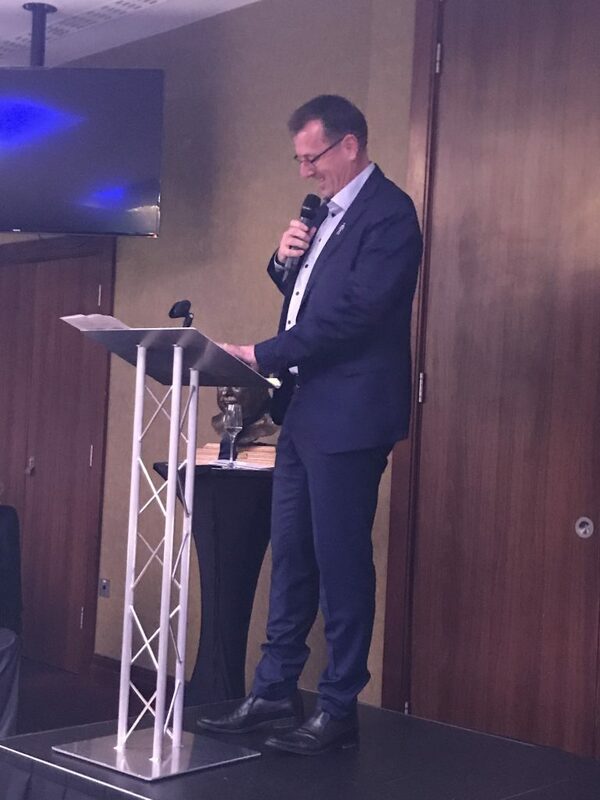 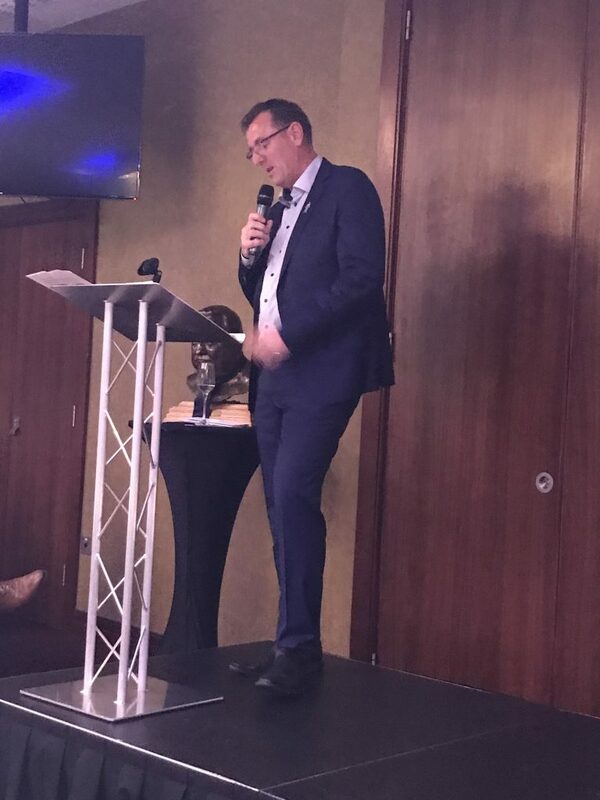 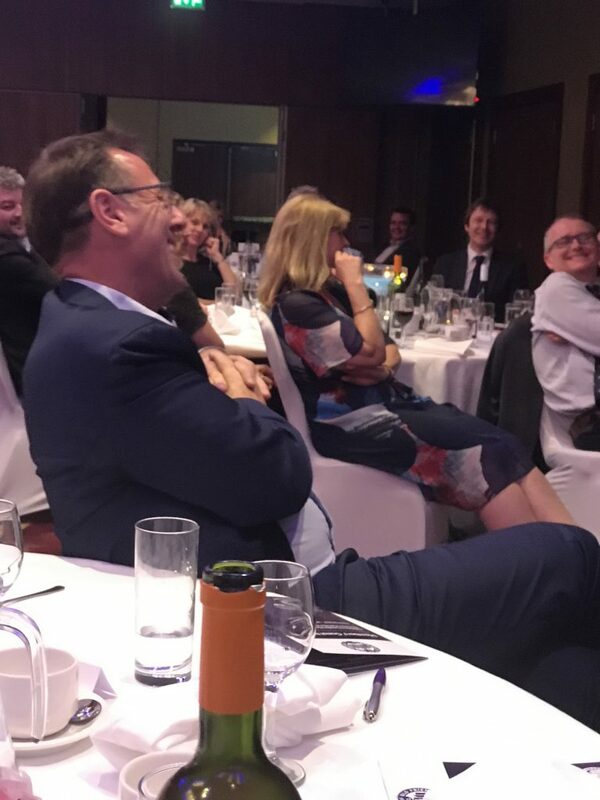 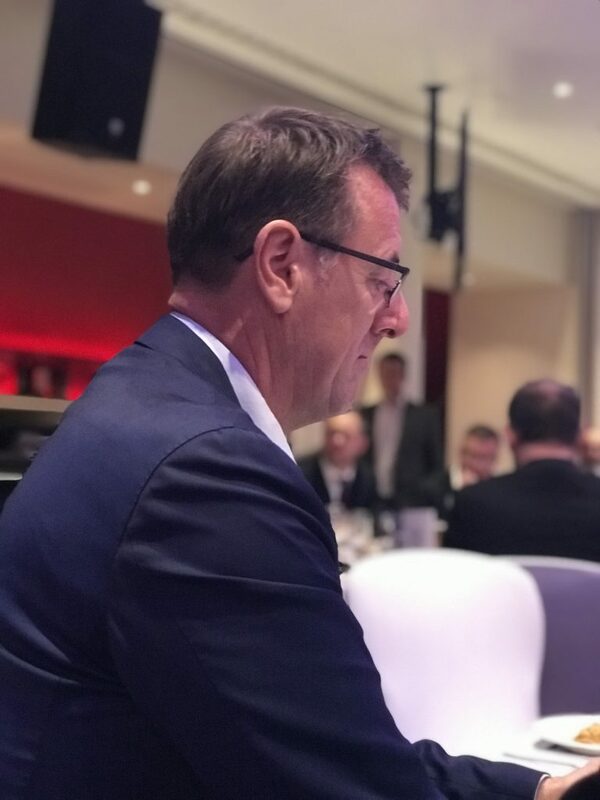 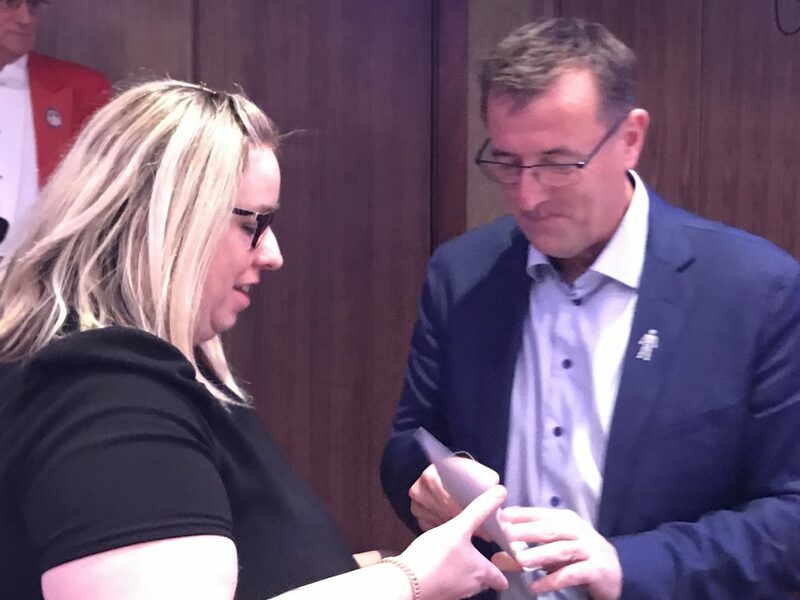 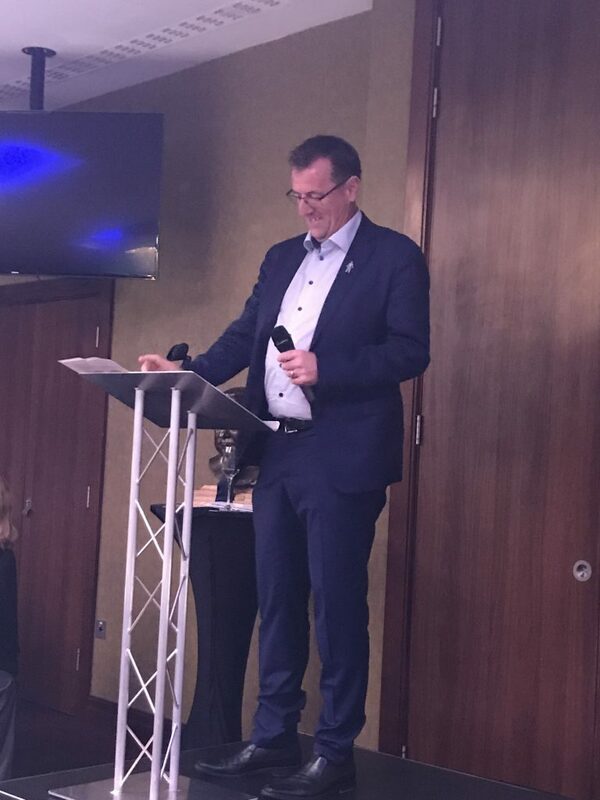 It concluded, “So Dear Lord please bless our Spring Dinner, With the great Matt Le Tissier, a Saint, not a sinner!” the “Amen” being followed by warm applause. 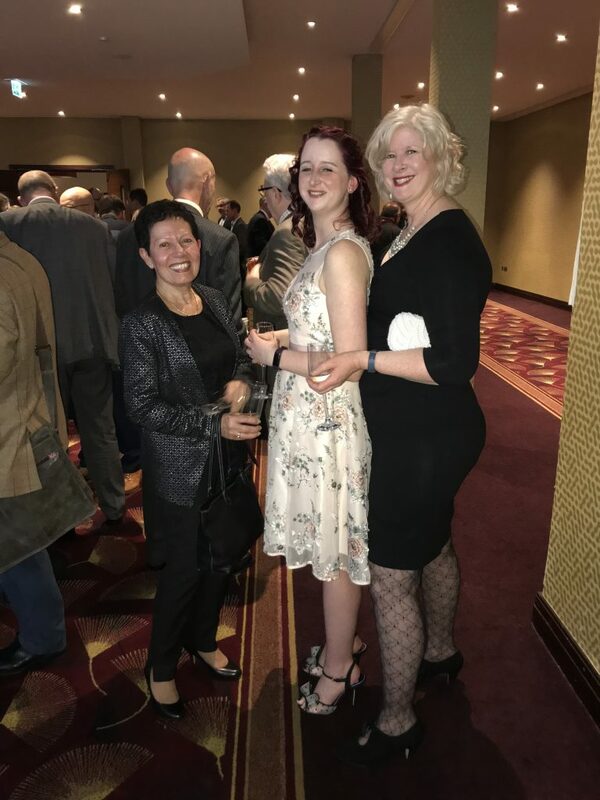 It was a very nice meal, with Prawn and Avocado starters, followed by a delicious Cannon of Lamb and Apple Tarte Tatin, all accompanied by copious amounts of wine! 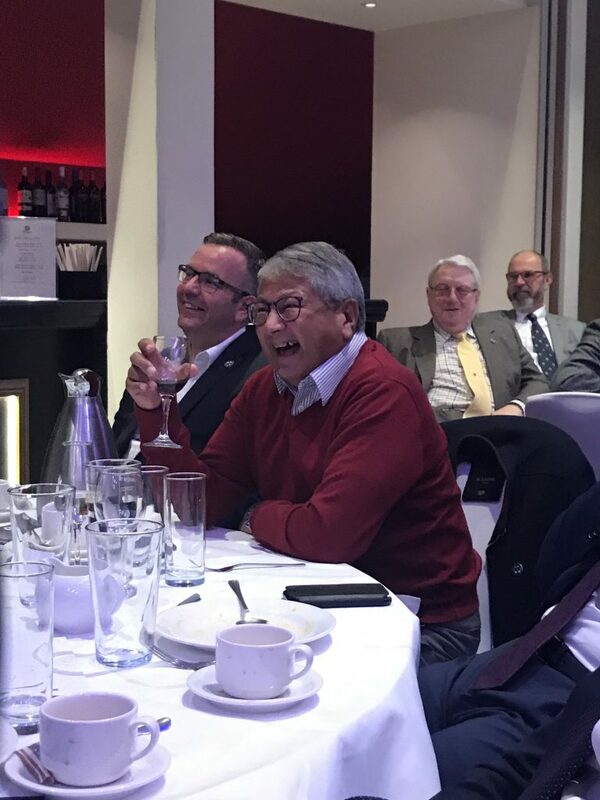 This was to be David’s last Guest Dinner as President, and he told those present that he was determined that the values of Jack Barwick, Frank House and the early Old Friends should live on, camaraderie and good fellowship, “Eat, drink and be merry” he said. 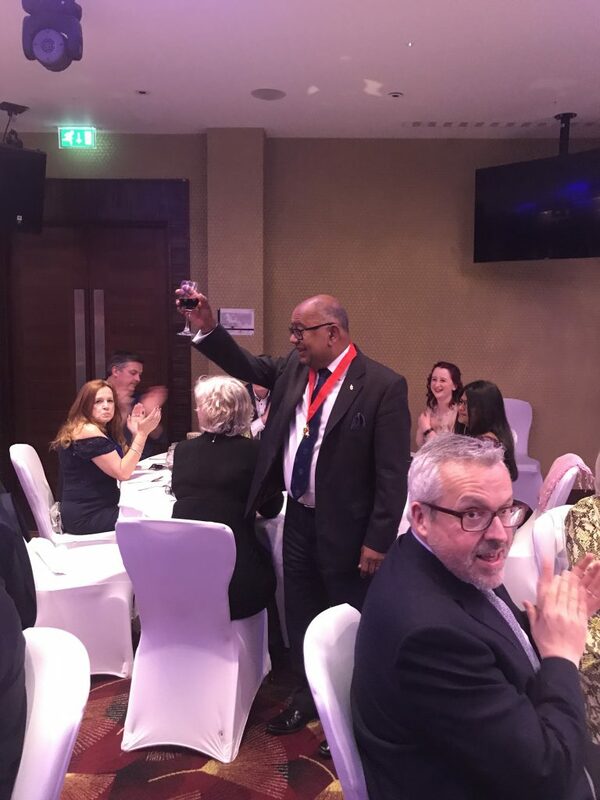 The 9 o’clock toast was, as always, a moment of reflection when the Old Friends turn their thoughts to absent friends. 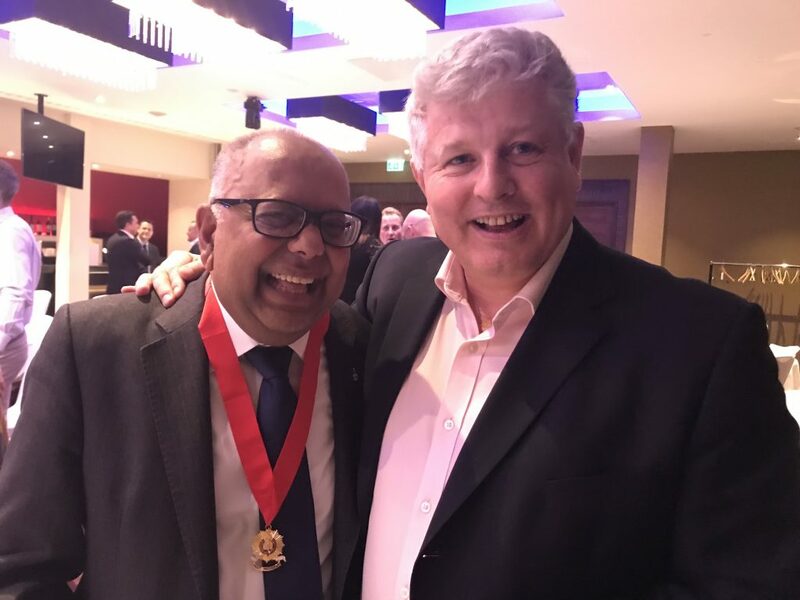 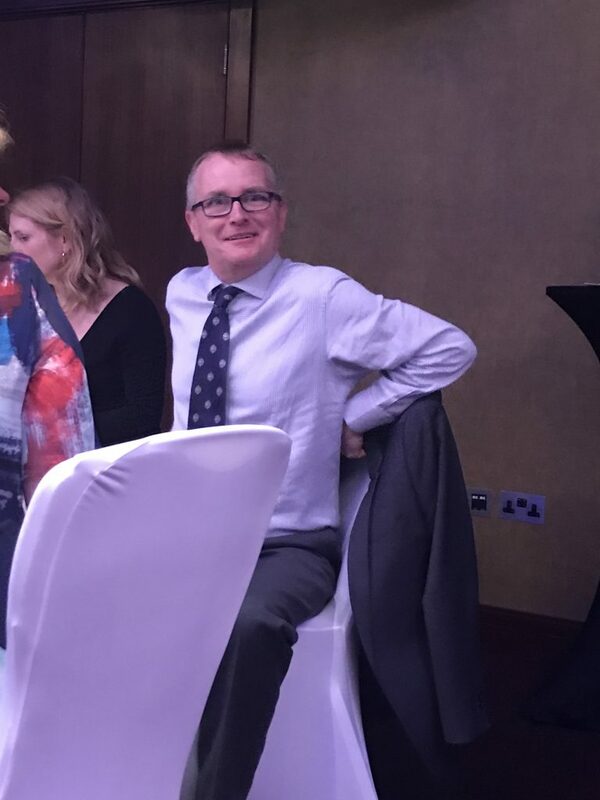 On this occasion, the President gave a special mention to Old Friend David Nelsey, who had planned to attend, but who has recently been diagnosed with a cancer behind his tongue. 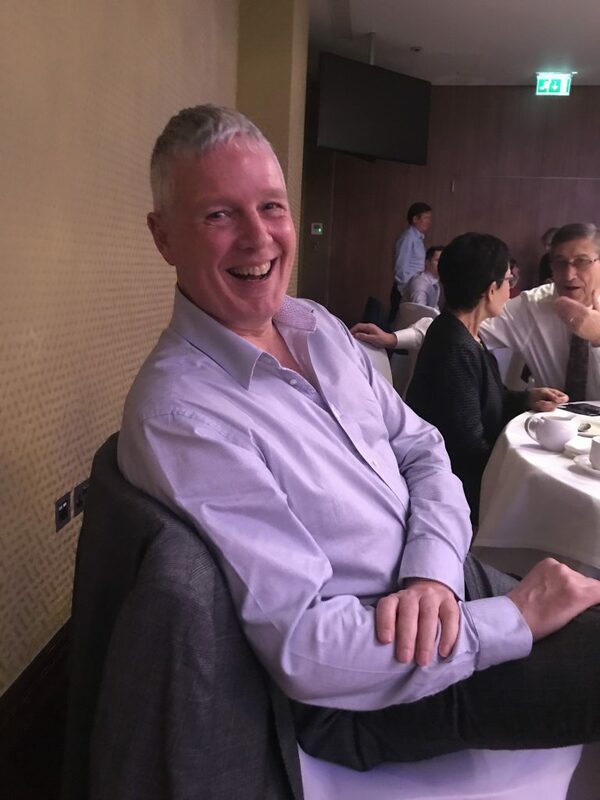 David is about to undergo treatment and the Old Friends sent him their love and best wishes. 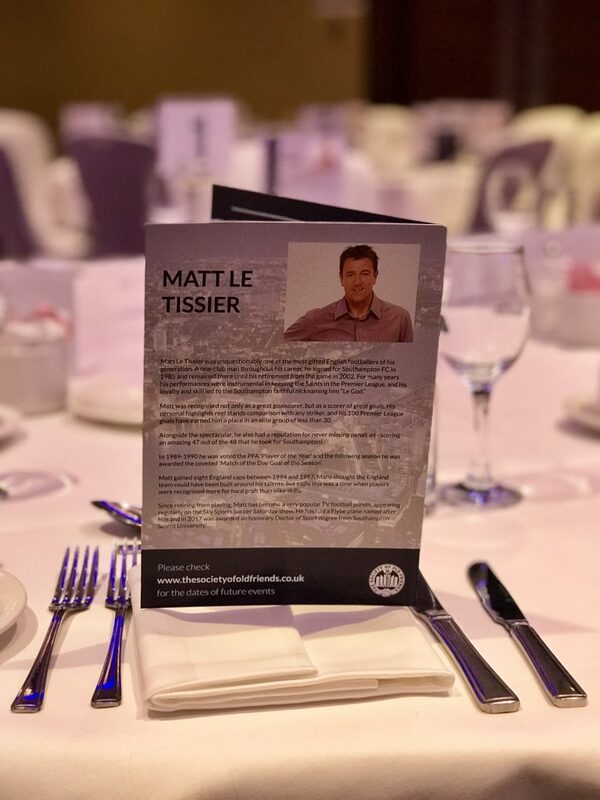 Introducing Matt Le Tissier, the President described him as one of those players who you would have loved to have played for your team – a football genius. 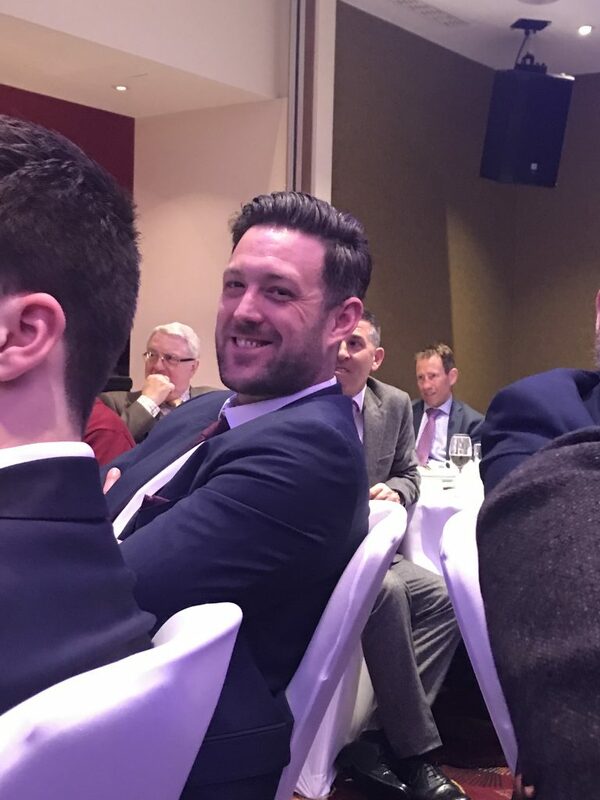 Matt had only ever played for Southampton, scoring over 200 goals for them in his career. 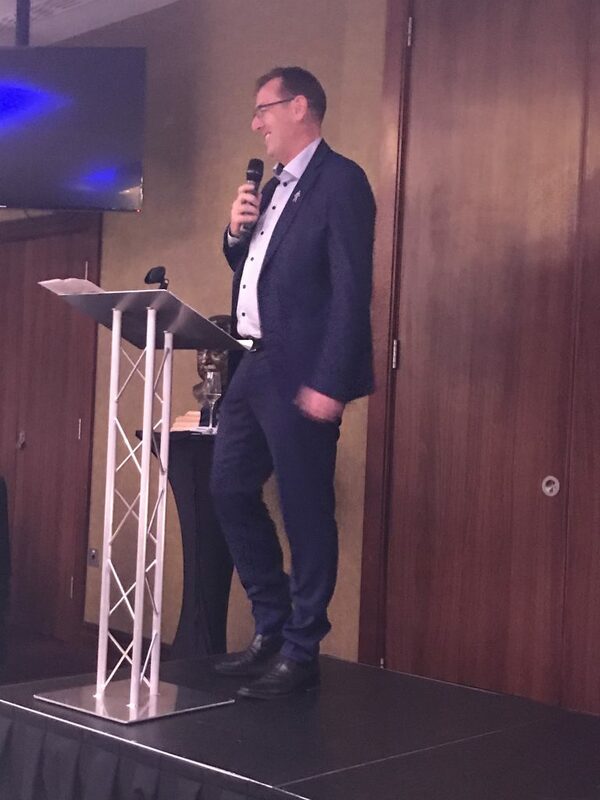 The fans adored him and called him Le God! 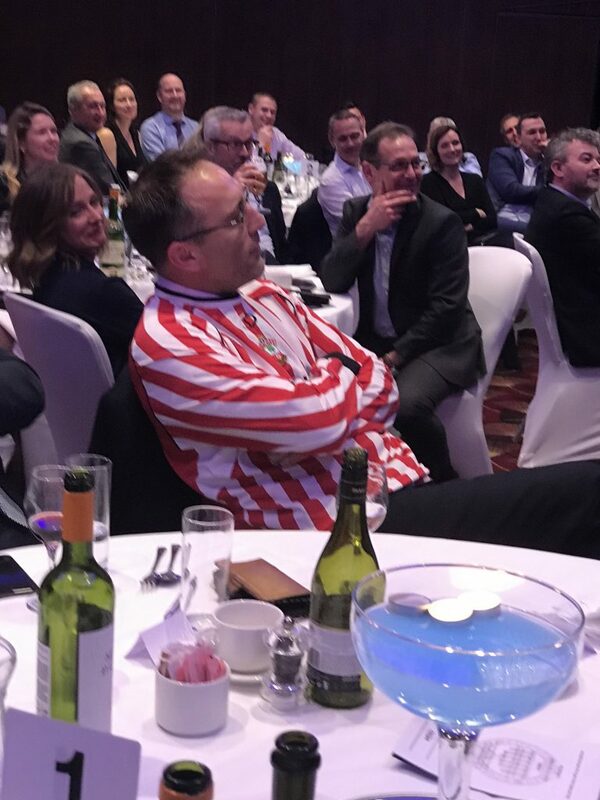 One of the President’s guests, Tony Milford of Asolvi, stood at this point and put his (freshly signed) Southampton shirt on over his suit, drawing applause. 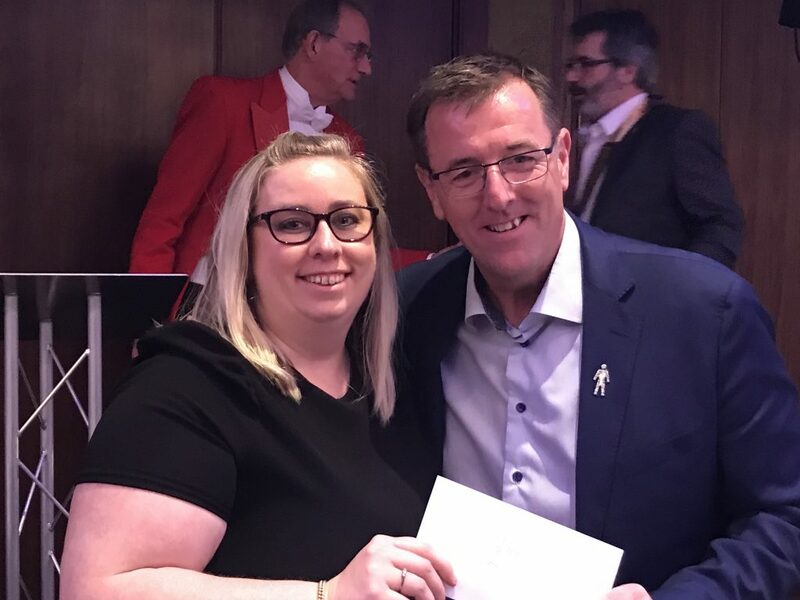 Le Tissier was one of the most talented players of his generation and given that he scored 47 out of 48 penalties, many thought the England team should have been built around him. 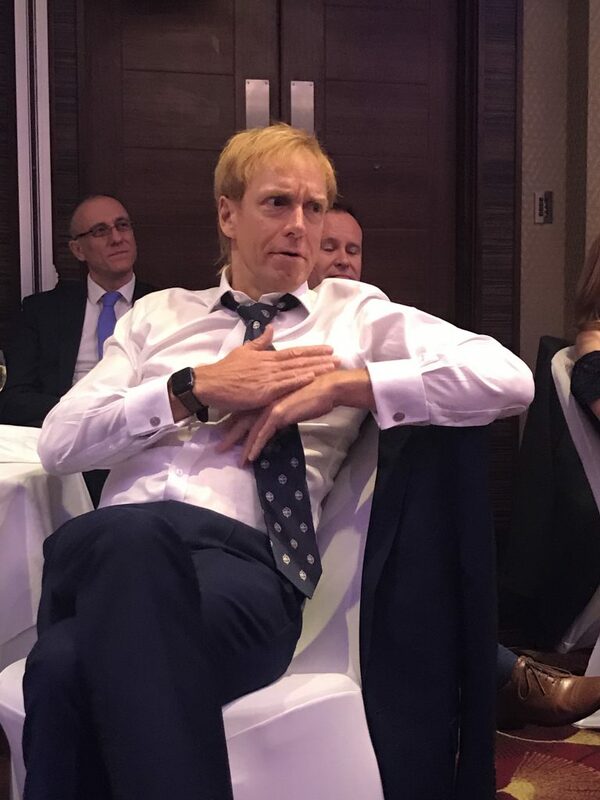 Instead, he was capped only 8 times by England. 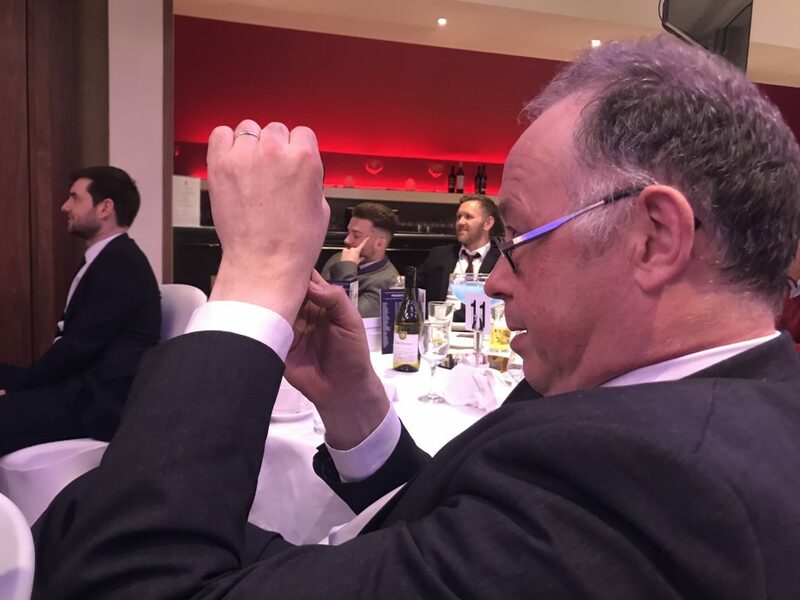 However, timing being everything, just this past week, Matt had been on television captaining a team of England veterans to victory over their German counterparts. 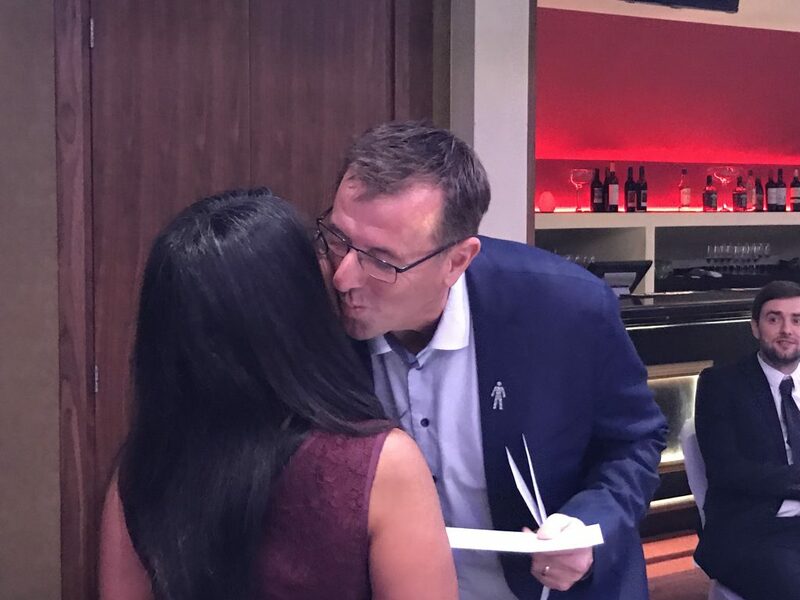 Not just one of Harry’s Heroes, one for all of us! 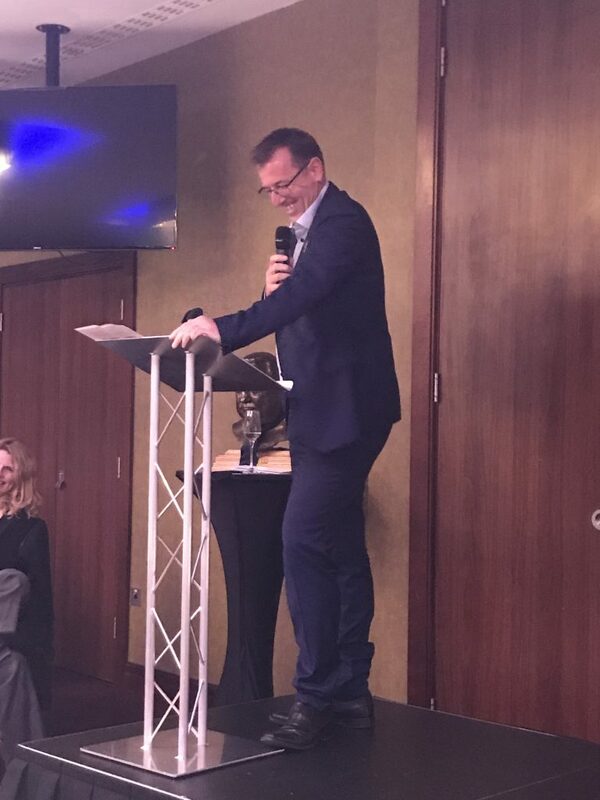 In his response for the guests, Matt began his speech by referring to the President’s resemblance to a certain well-known comedian and previous guest. 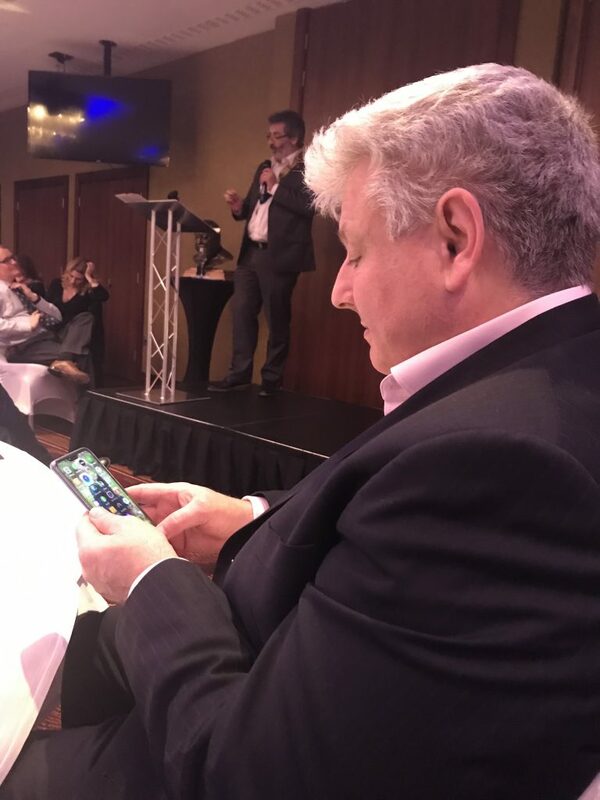 “I thought Mr Baddiel would have been funnier” he said, and that was that, the audience were, in football parlance, onside! 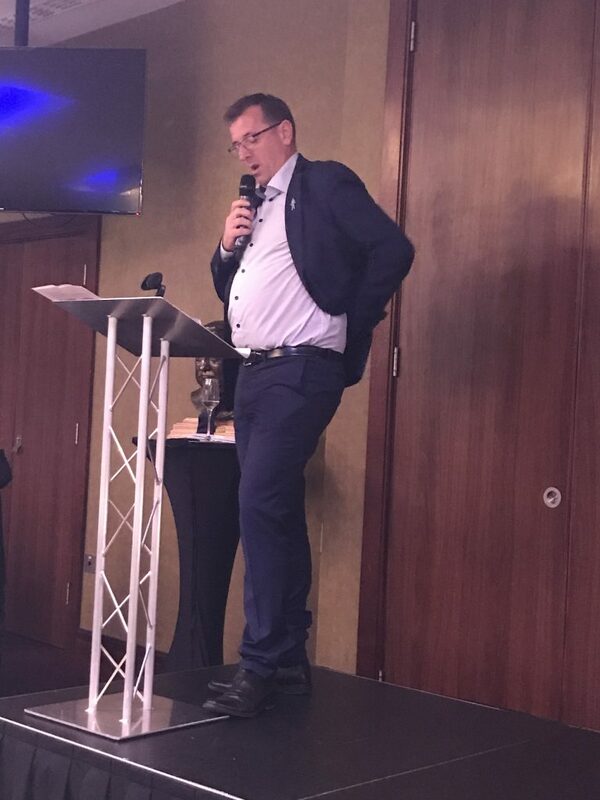 And so it went on, great anecdotes about his own upbringing in Guernsey, his years in the game, teams, managers, players and rivalries, with lots of self-deprecating humour about his own body shape and limited athleticism, including one manager telling him, “Get warmed up, Matt, I’ll be taking you off in a minute”. 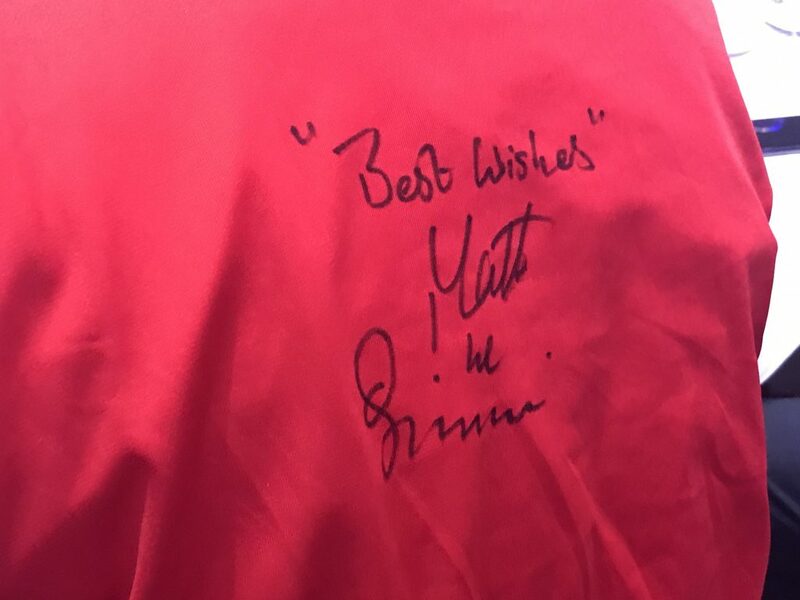 Since retiring, Matt has been seen weekly on Sky Sports. 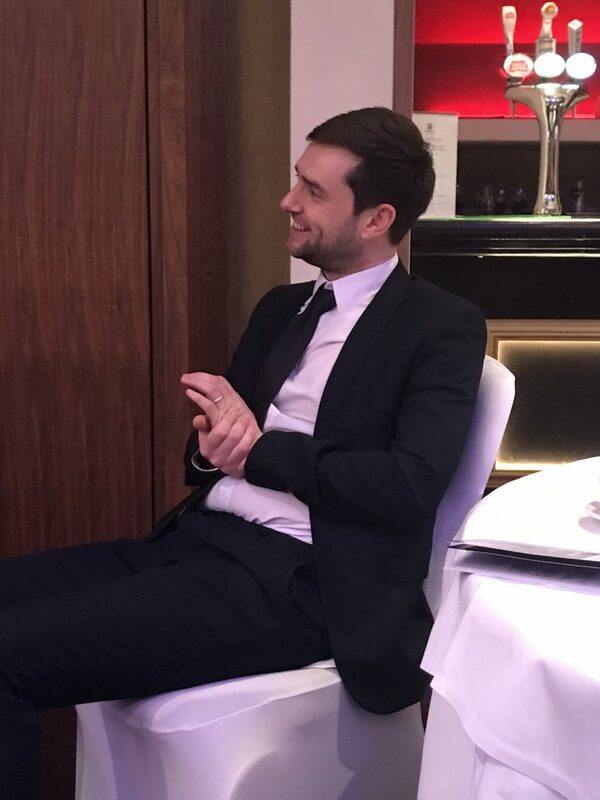 “Many people think I’m a millionaire because I’m an ex-footballer and I’m on the TV a lot, but obviously I’m not. 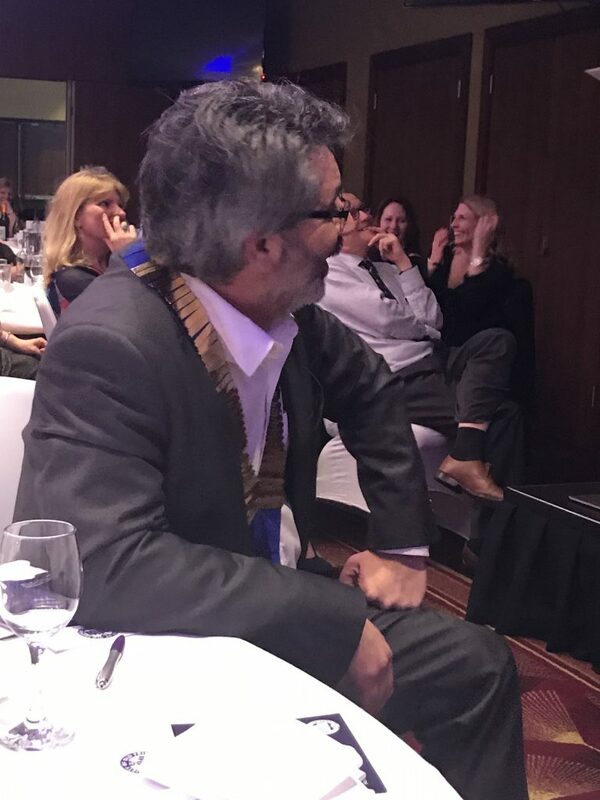 If I was, would I be here?” he joked. 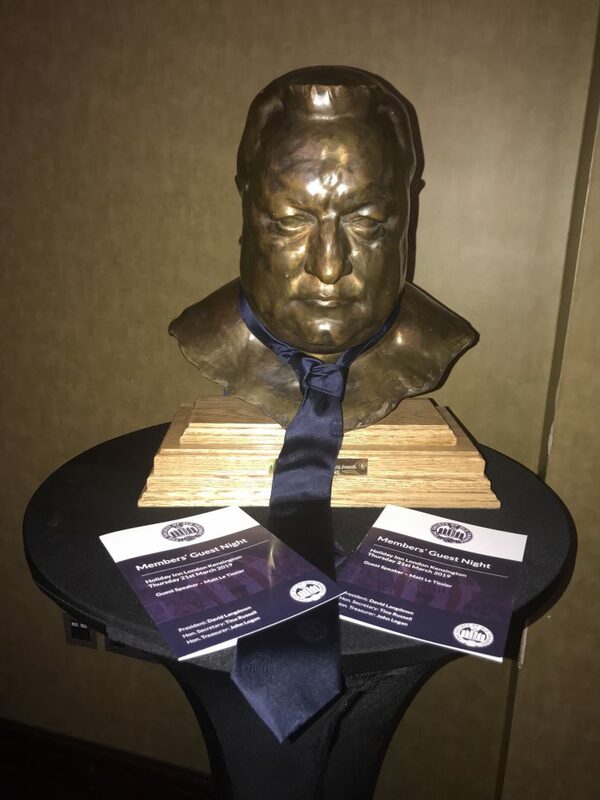 But do you know what, I think he would have been, because he struck me as a man who never loses sight of where he came from or how lucky he has been. 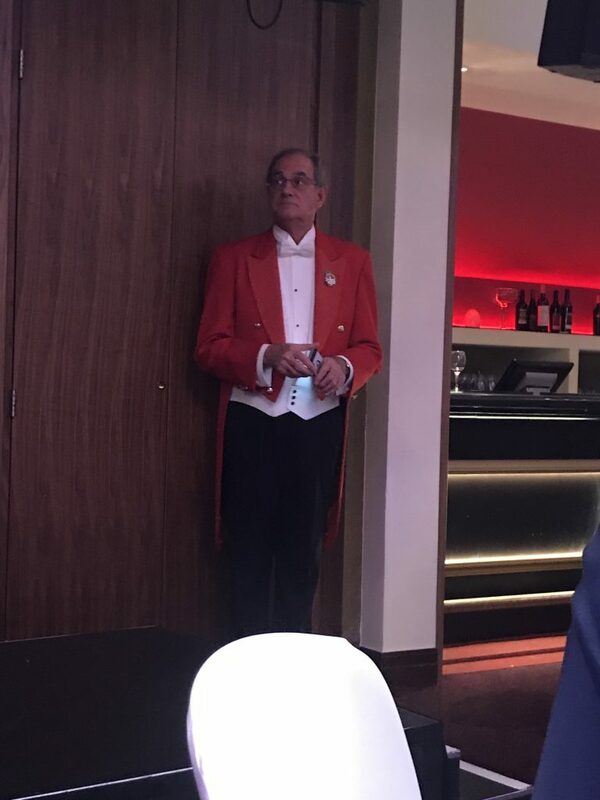 He was a great guest. 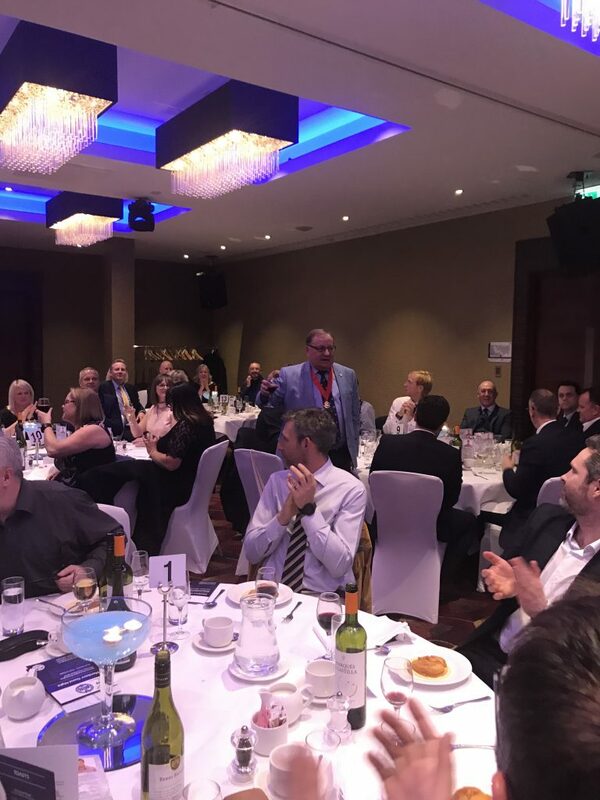 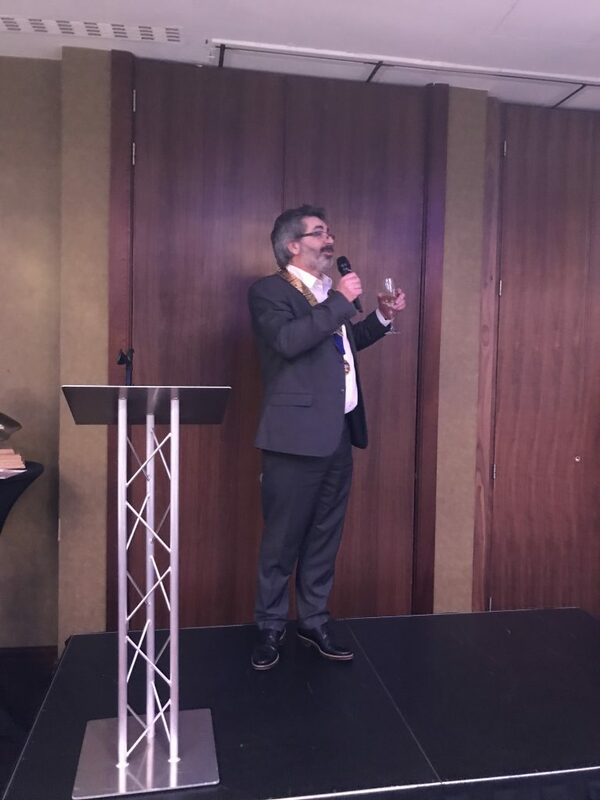 There was a raffle, with the prizes being: £100 won by Janine Hill, £50 won by Steve Bilton and £25 won by Nila Mistry, both who donated it to the Business Supplies Charity.